After a very smooth 7 hour flight on Ethiopian Airlines we arrived bleary eyed into Addis. The jacaranda trees in full bloom were the best welcoming committee we could have hoped for…..we were now in Africa!After the typical convoluted African airport process of visa obtaining, passport control, luggage tag checking and security checking (to leave the airport….I’ve never had that one before! 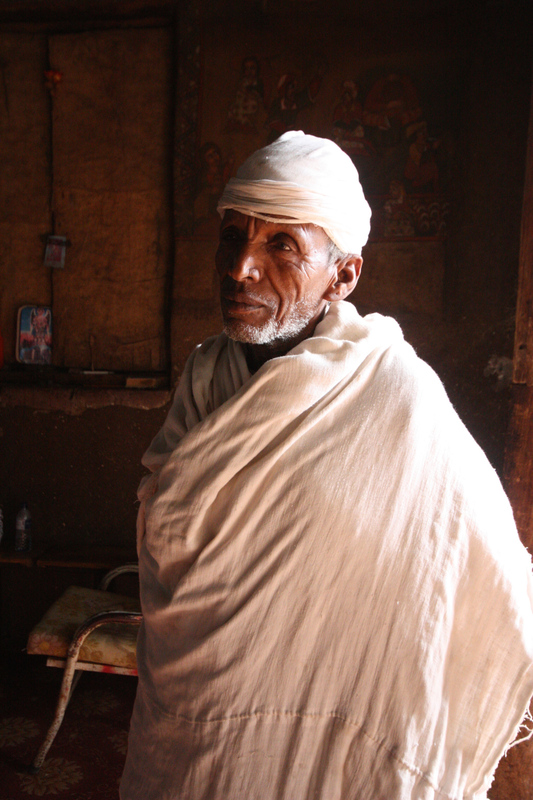 ), we were met by our guide Dawit. 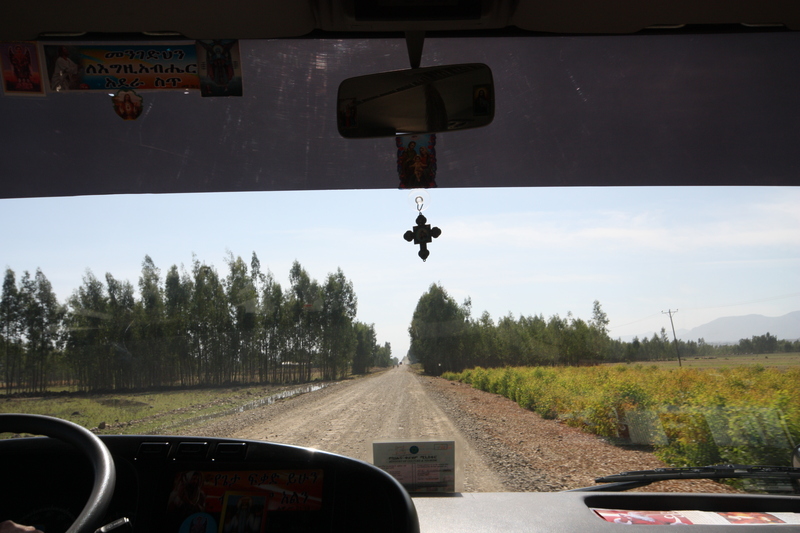 He was superb, introducing us to Ethiopia & Addis as we drove along, trying to get our bearings. 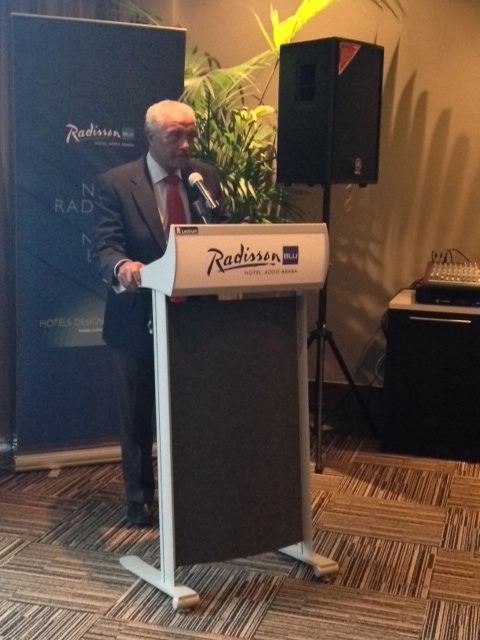 We were staying at the Radison Blu hotel, a new hotel which opened in 2012. On arrival we met up with the other fam trip host – Janet Shankland from One Greenstone and imparted the glorious words everyone wants to hear after an overnight flight. “Tuck into the breakfast buffet & get a few hours rest before we head out to explore Addis” Needless to say I took her advice and emerged refreshed a few hours later ready to explore Addis. First we needed to change some money. It took 20 minutes, 5 forms plus 10 different members of staff to change $300 into bihr……I love Africa! First stop was the Trinity Cathedral which was built to commemorate the country’s liberation from Italian occupation. 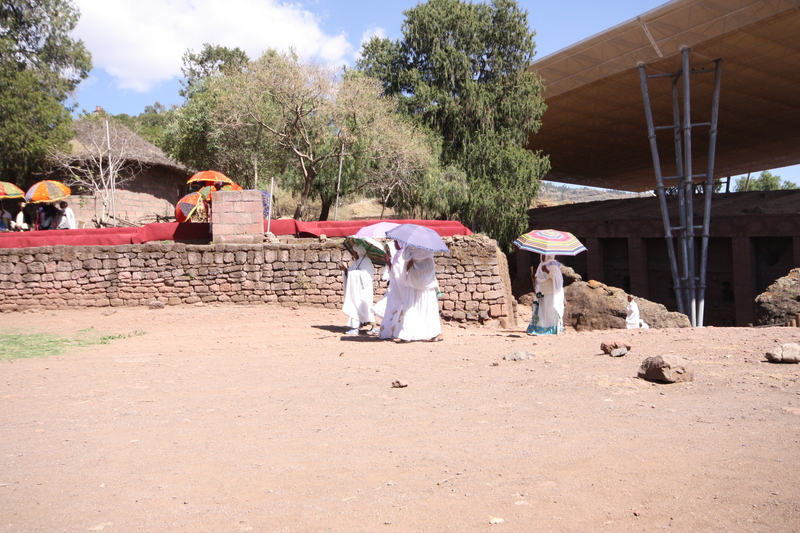 It is also home to the tomb of the Ethiopian legend, Haile Selasse and his wife. Isabel from Wildlife Worldwide and I got so carried away trying to get the perfect photo of the tomb that when we finally emerged we’d discovered we’d been locked in and the rest of the group were merrily making their way to the bus. 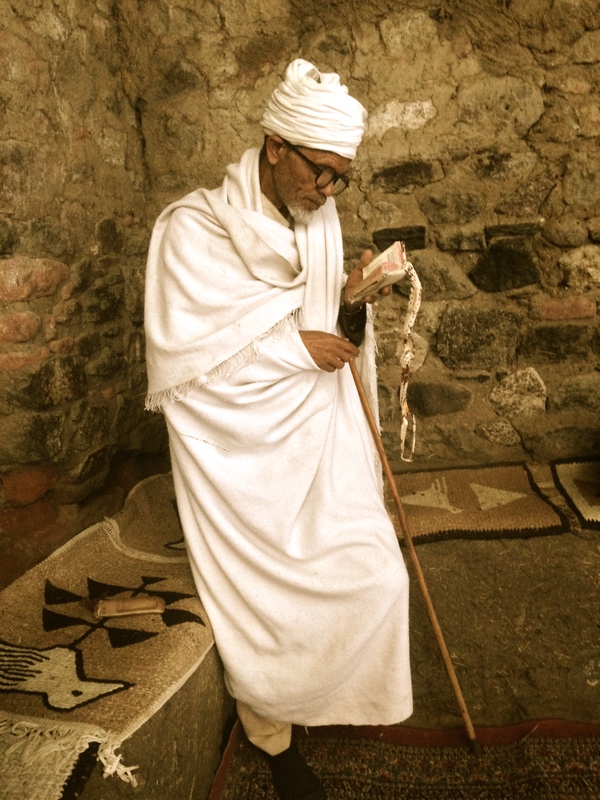 A few loud shouts later, the emergence of a poor confused priest and we were free…..as legendary as Haile Seleasse was I wasn’t too keen about spending the night in his tomb! Next stop was the ethnographic museum which gave a fascinating insight into Ethiopian life & culture and the National museum where the infamous ‘Lucy’ is held. It is mind blowing to think how many important discoveries on the human race have been made in this area. 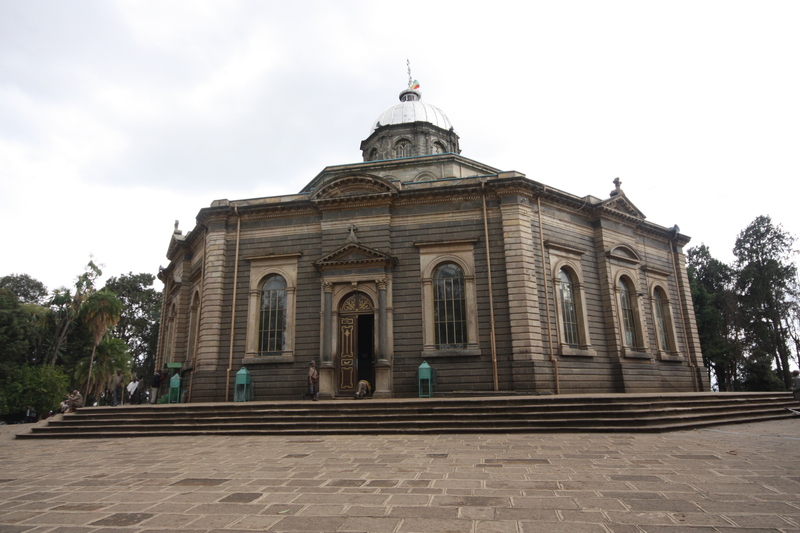 St George’s Cathedral was founded in 1896 to commerat victory over Italy in the battle of Adwa. Italy were so embarrassed that the Italian’s lost this battle and failed to colonise Ethiopia that Musselini decided to try again and in 1936 the Italians started a 5 year occupation. This is the closest that Ethiopia got to being colonised and proudly remains the only African country not to be fully colonised. At least poor old Italy can be happy in the knowledge that their ineptitude to properly colonise the country has led to two fascinating churches being built! The other major Italian influence in Ethiopia is seen in the food. We had dinner in the oldest Italian restaurant in Addis called Castelli’s. Our table was groaning with the most delicious pasta dishes. It was incredible value with the average meal costing $5. 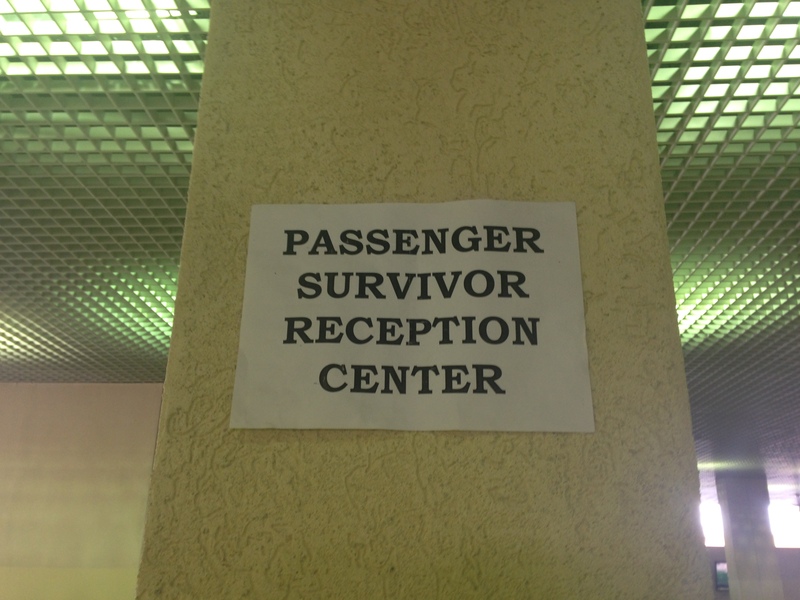 After an early wake up call, we checked into our flight to Bahir Dar. Unlike most other African airlines, Ethiopian Airlines often leave early so it is worth checking in well before you need to. The security at the airports is very tight so it does take longer to get through the airports. Whilst their security is very tight, according to the poster below they might be slightly more relaxed on the safety aspect of flights! After a 45 minute flight we landed in Bahir Dar which is a relatively new city having grown substantially since 1976. 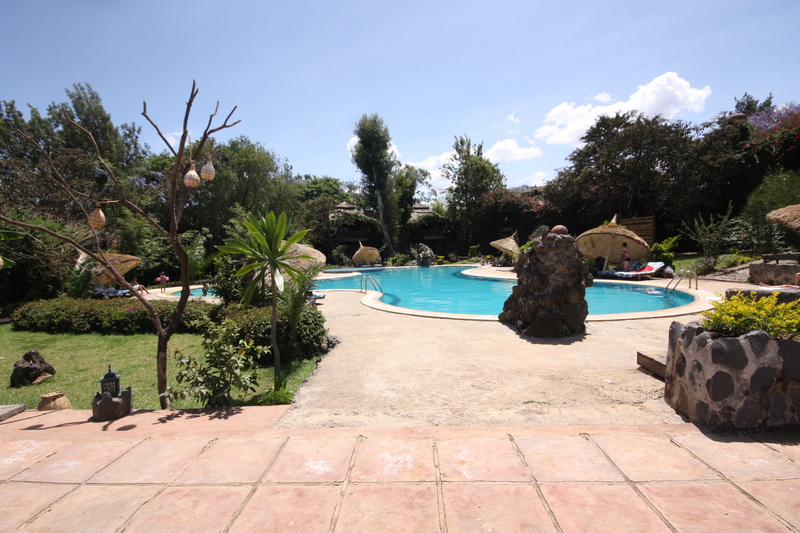 It has a feeling of a beachside resort as it is located on the edge of Lake Tana. We stayed in a charming resort called Kuriftu Resort which has 28 rooms and a very inviting swimming pool. 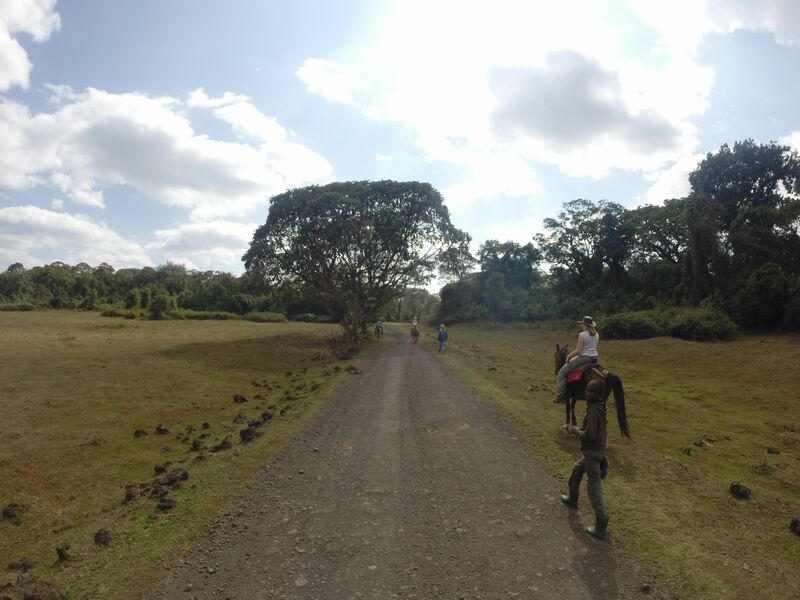 Unfortunately a dip was not on the cards as quickly we dumped our bags and set off on our journey to the Blue Nile Falls.The 1.5 hour journey took us through some beautiful Ethiopian countryside. It was so much greener and fertile than we imagined. 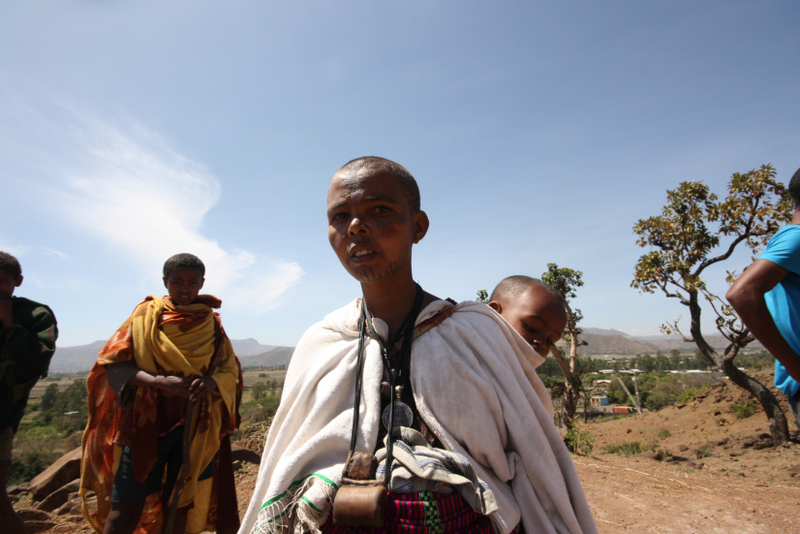 The preconception most of us had of Ethiopia being dry, arid and drought ridden was so far from the truth. 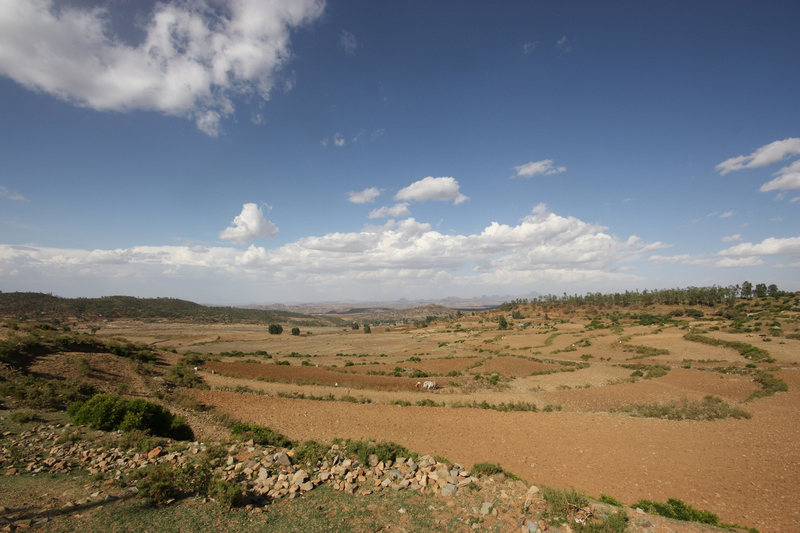 There are huge tracts of the country that are very dry but the majority is very green and fertile. As it was Sunday everyone was wearing their Sunday best comprising of long white cotton shawls which looked stunning when en mass. It was a 20 min walk to get to the falls which took us through some little villages. It was lovely to get so close to the villagers and get an insight into village life as you’re meandering through them. We were also lucky enough to come across an elderly lady making traditional njera, a pancake like staple food. 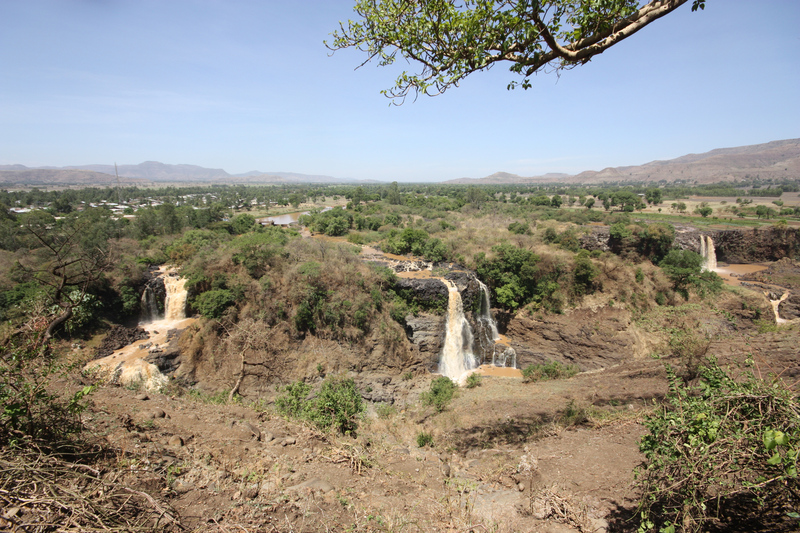 The Blue Nile falls were not as dramatic as normal due to it being dry season but they were still very impressive to see. The best time to visit the falls is August, Sept & Oct just after the long rains when the river is full.We were treated to the sight of a whole bank full of Cayenne Bee Eaters and a Long Crested Eagle as we emerged from the falls…..this was just a taster for some of the incredible birdlife we would be treated to in Ethiopia. By the end of the trip we had all turned into twitchers! The drive back seemed far quicker although slightly disconcertingly we came across two accidents….both featuring local buses!After a delicious lunch we set off on on our boat trip across Lake Tana to visit two of the 12 monasteries on the lake called Ura Kidanemihret and Azora Mariam. It was fascinating walking through the thick forest before emerging into a clearing with a very unassuming round church in the middle. We made our way through a gap in the wall to discover the most incredible paintings depicting scenes from the Old and New Testament all over their walls. It is quite mind blowing to think of all the incredible artwork in the (relative!) middle of nowhere! Before leaving Bahir Dar we popped into the Abay Minch Lodge which at $82 per room is a great option for people whose budgets don’t stretch as far as Kureftu.Our four hour bus journey took us through some stunning countryside and the various stops allowed us time to practise our Amharic with locals! 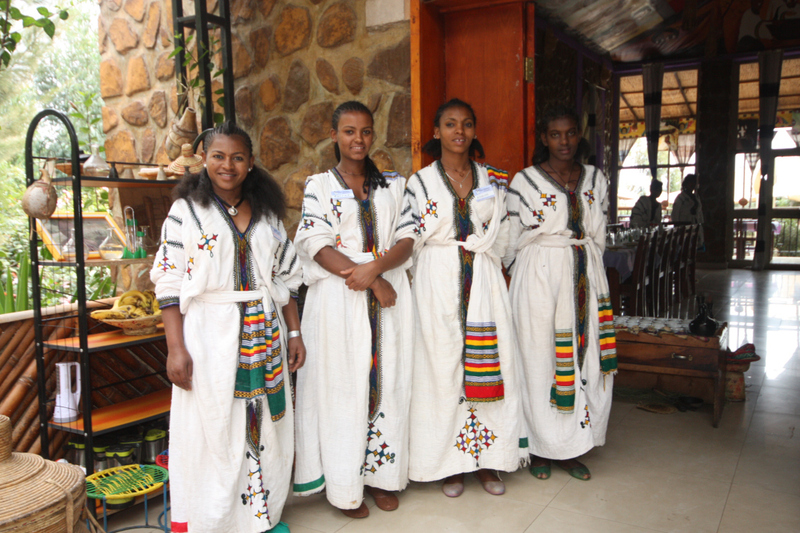 Our first stop in Gondar was the Four Sisters restaurant. Anyone coming to Gondar must eat here! They had a buffet lunch with a mixture of Ethiopian and English food & it was delicious!!! We felt like celebrities being greeted by the four sisters in traditional costume on arrival. 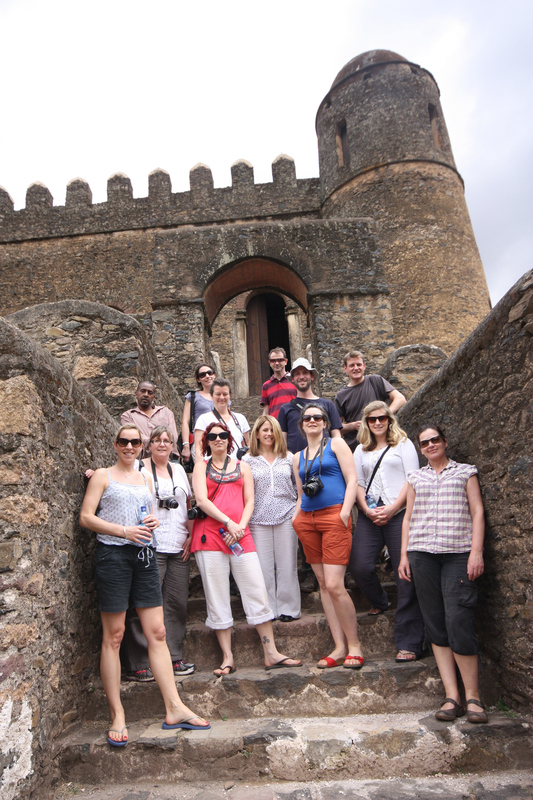 Gondar was a fascinating city. 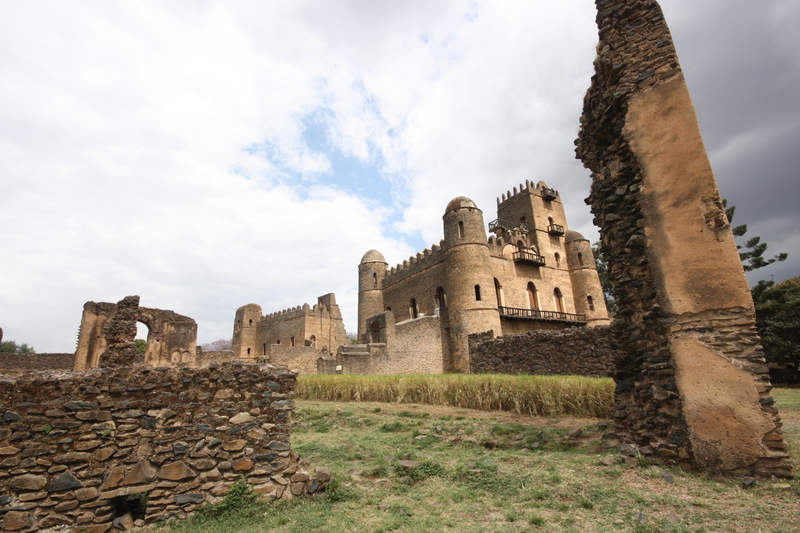 The Kings of Ethiopia had their power in Gondar for 2 centuries. 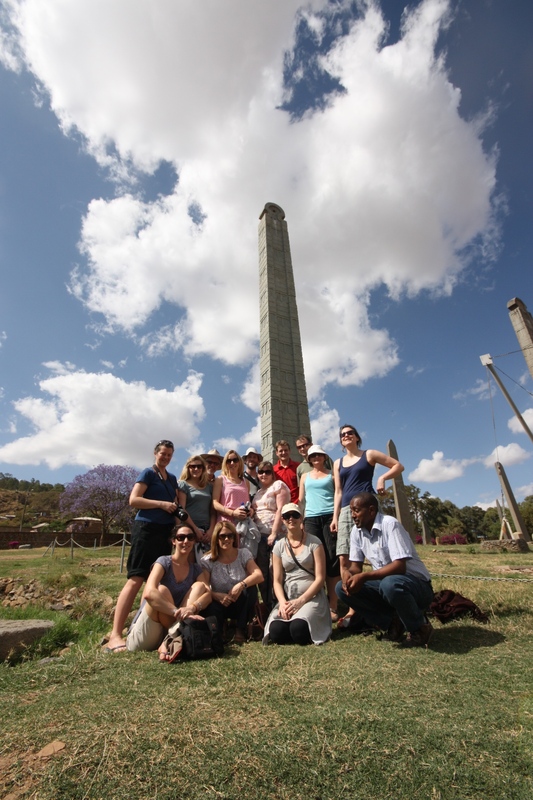 The city was the first capital of the Ethiopian empire, which began in 1632 with the reign of Fasilidas. There are a dozen castles built by various emperors over the course of 236 years and many of these lie in a plot in the centre of the town. The castles provided us with yet another great photo opportunity! Fastledas – the king who built the first castle built this as a weekend retreat. The bath only gets filled for Temcat on January 19th. It takes a week to fill the pool & the water is diverted off the river. 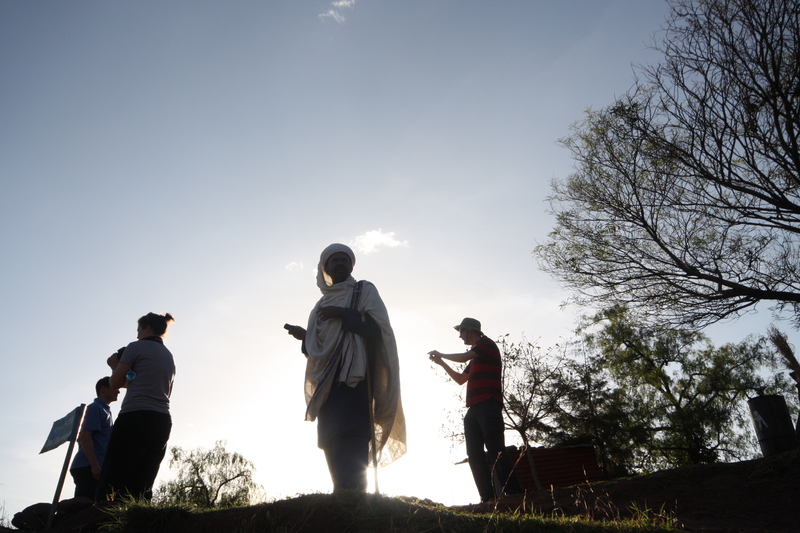 The tablets are brought & blessed and there are thousands of people who come to experience it. 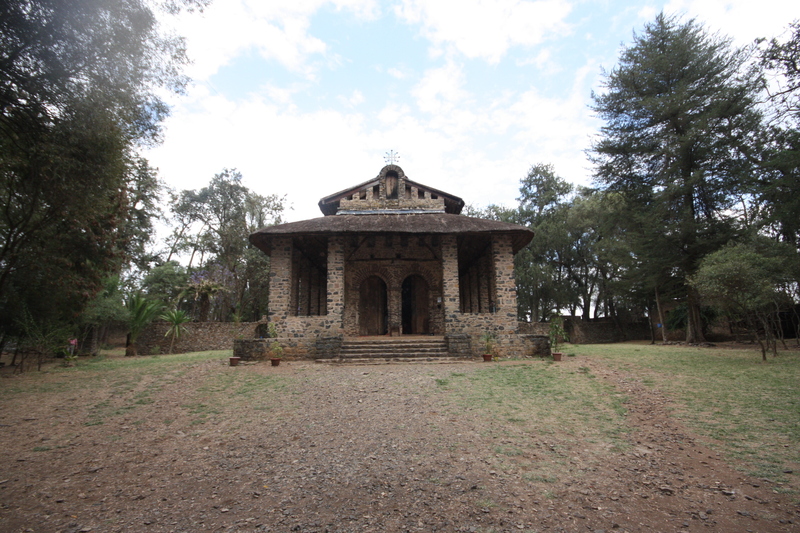 Debra Haile Selaiisse – This church built by the grandson of the fastilas king who built the 3rd castle at Gondar. His original aim was to bring the Arc of the Covenant to the church but legend has it that the tablets wouldn’t move. It was also the only church which wasn’t burned by the Sudanese muslims in 1888. Apparently they tried to burn the church but they were attacked by bees. We finished off the day by doing some hotel inspections of Doha hotel & the brand new Landmark hotel but were delighted to be staying at our favourite by far, the new Mayleko Lodge which is out of town & near the airport. 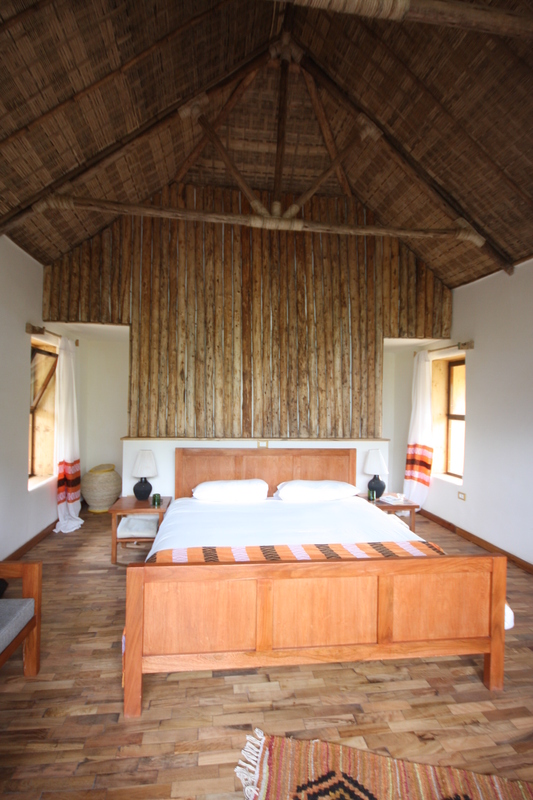 It only opened 4 months ago and has individual stone & thatch bungalows and yummy food……..what more can you ask for! 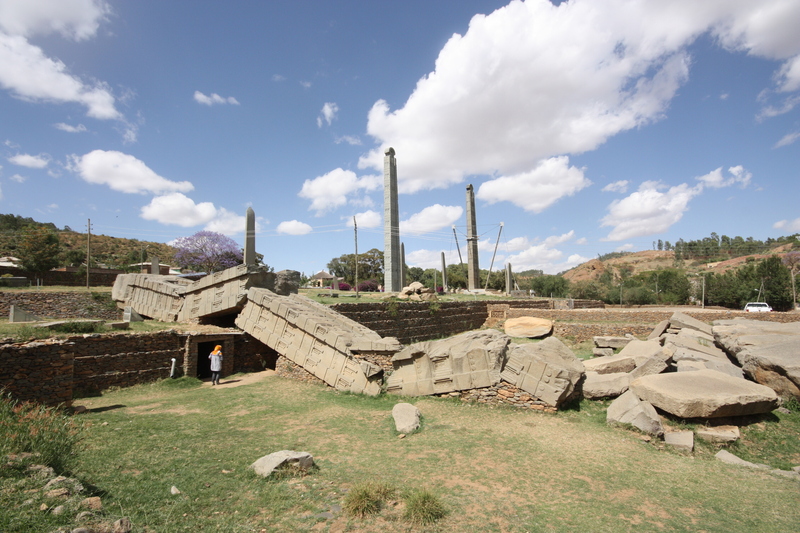 From 400 to 700AD Axum was the seat of an empire which extended from the Red Sea to Arabia. It is now an unassuming town on the surface but is home to the most unbeliveable treasures. After dumping our bags in the Sabean hotel (a pretty non descript town hotel….I would recommend staying in the Yeha hotel instead!) 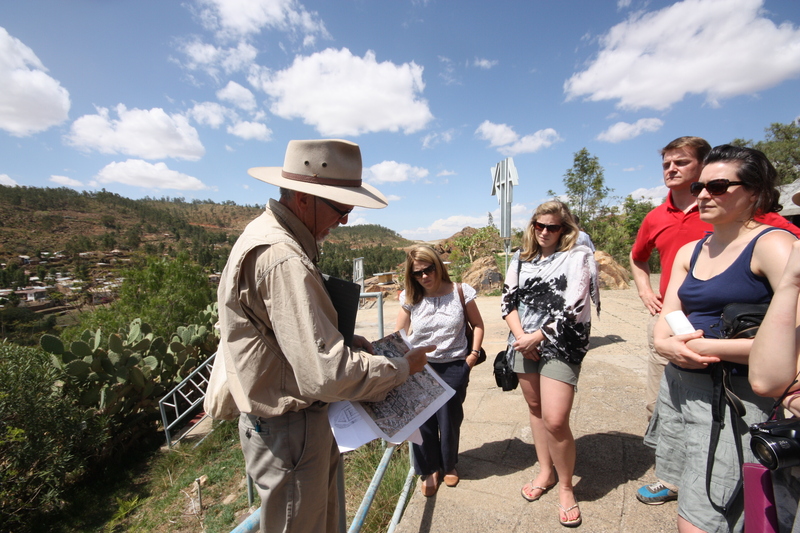 we were met by the Archaeologist Sam Walker who was to be our guide for the day. 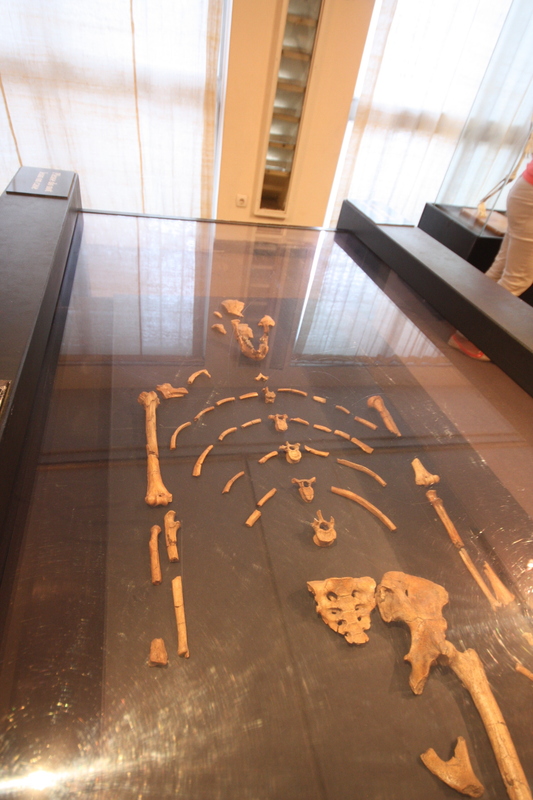 Sam works for Axum University and has the challenging job of helping to uncover new finds whilst also ensuring that those that are already known about are protected properly. 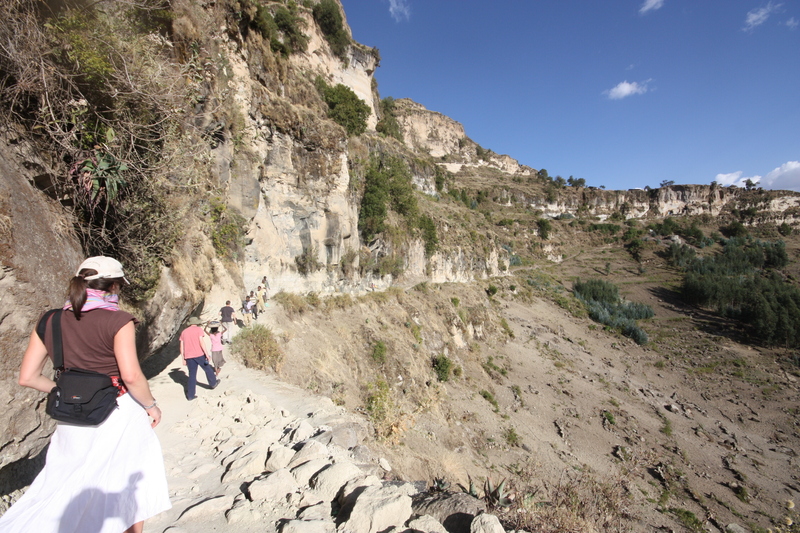 He was a few minutes late meeting us as he had just come from showing George Bush around the sights of Axum……having us lot must have been quite a come down after the heady heights of GW Bush! 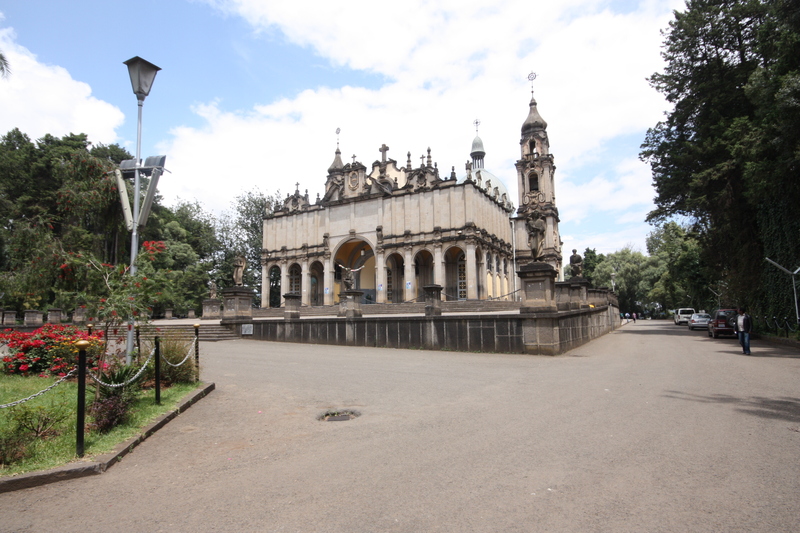 First stop was the St Mariam church which Haile Sellasie built in the 60s. 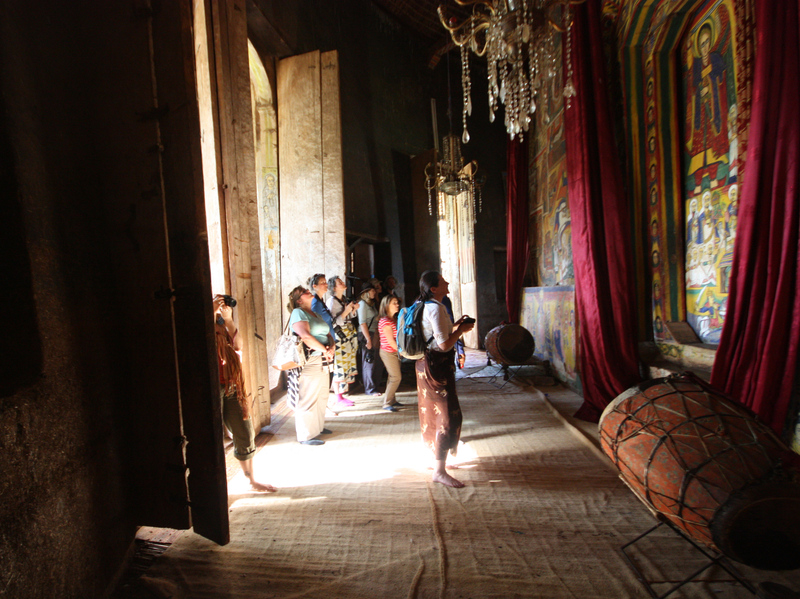 Daily prayers were being sung when we were looking around and it was glorious to experience filled with the sound of mesmerising singing. The priests very kindly carefully unveiled a manuscript which was 500 years old for us to see. It was in amazing condition considering it was used daily. 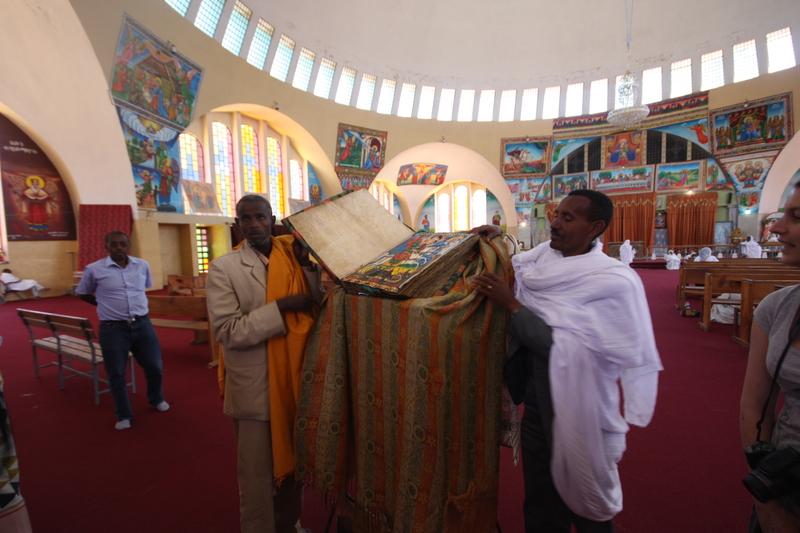 Sam then showed us the Mariam Tsion Church which was said to house the Arc of the Covenant, the original holy tablets. Unfortunately you are forbiddden to go inside so we weren’t able to see if this was true or not. However, we were to witness our own miracle when Sam took us downstairs beneath the church to a modest room which housed the most unbelievable treasures. There were coronation crowns from most of the Ethiopian kings, their robes & other gold & silver ornaments and many ancient manuscripts covered in dust. We were all flabbergasted that all these treasures were just thrown casually into glass cabinets with very little security, order or seeming care!! 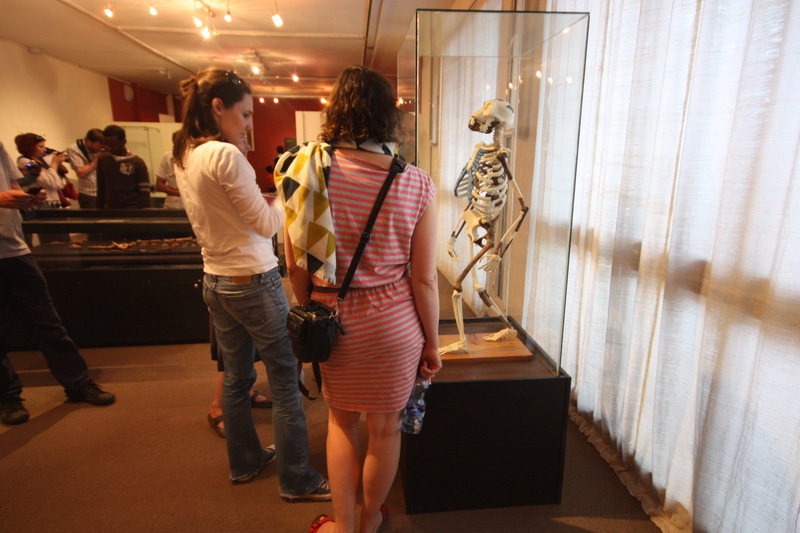 This one room housed far more interesting artefacts than the entire national Museum in Addis. The most mind boggling aspect was that normally it was not open to the public but unfortunately they didn’t allow any photos. 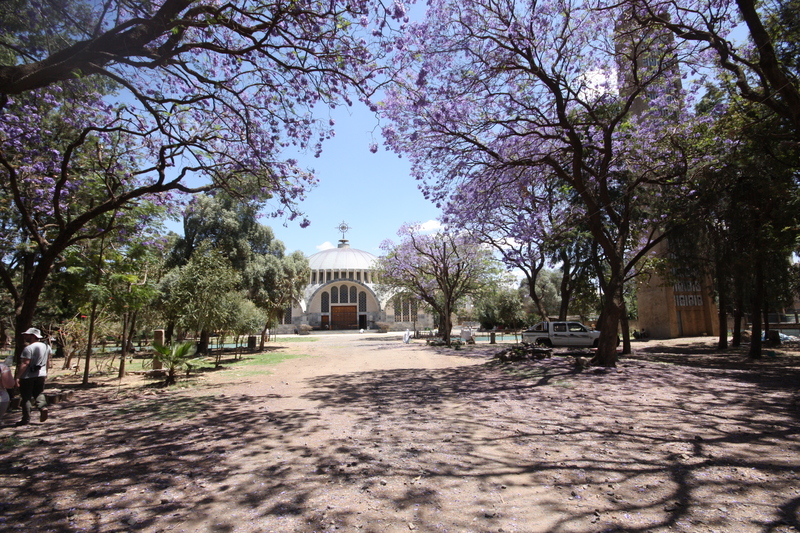 We couldn’t believe that all these treasures aren’t even seen by those who come to Axum. 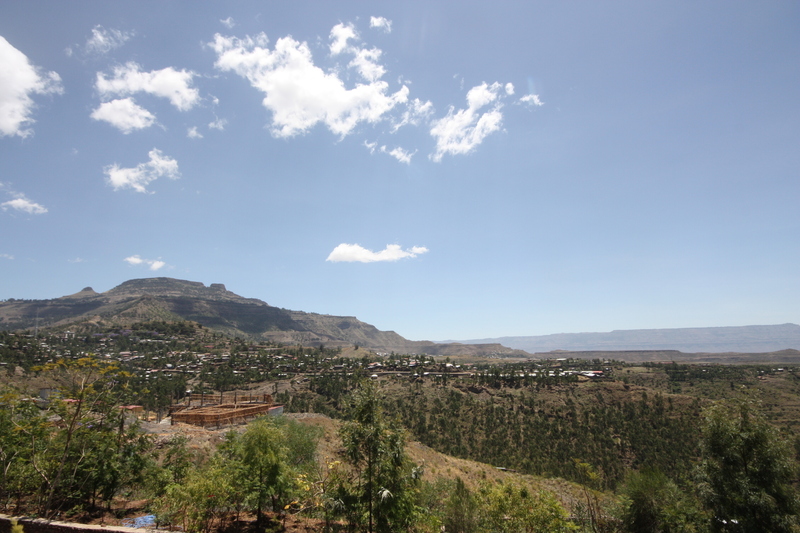 We refuelled at the Yeha Hotel for lunch which is well worth a visit….not for the hotel itself but for the view over Axum. Sam showed us around the Stelae, huge monuments on top of tombs. They were erected in 350AD and are still standing tall today……apart from one that fell over when they were trying to erect it. I can’t imagine how upset they must have been to have spent all that time creating it and carving the monument from one piece of rock, then transporting it the 6km from the quarry only for it to fall at the last hurdle! As if to make matters worse it fell onto another tomb destroying that too! Next stop was the hill top tomb of Kaleb and his son. The tombs were on top of a hill which had views all the way to Eriteria. Sam had discovered signs of a palace from around 400AD being on the site and he had applied for permission to excavate it which will undoubtedly bring up more fascinating finds. Our final stop was at the ruins of the Palace of the Queen of Sheba which was again brought to life in a gripping way by Sam. 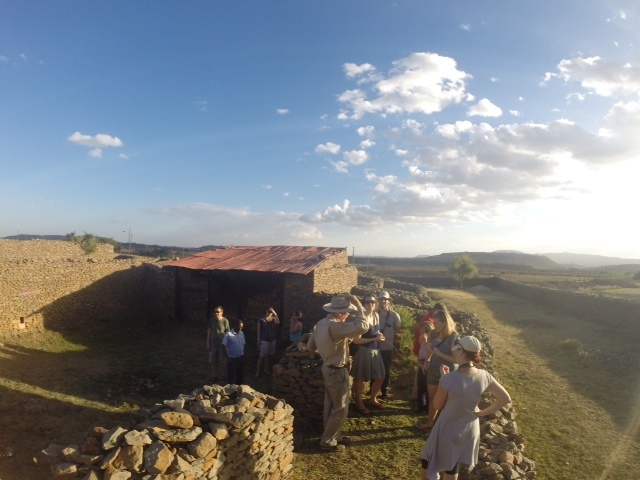 The team were so impressed by Sam and the way he explained the fascinating history and archaeology in such a simple but absorbing way. No wonder he had hosted so many dignitaries such as G W Bush….and our fam trip group! 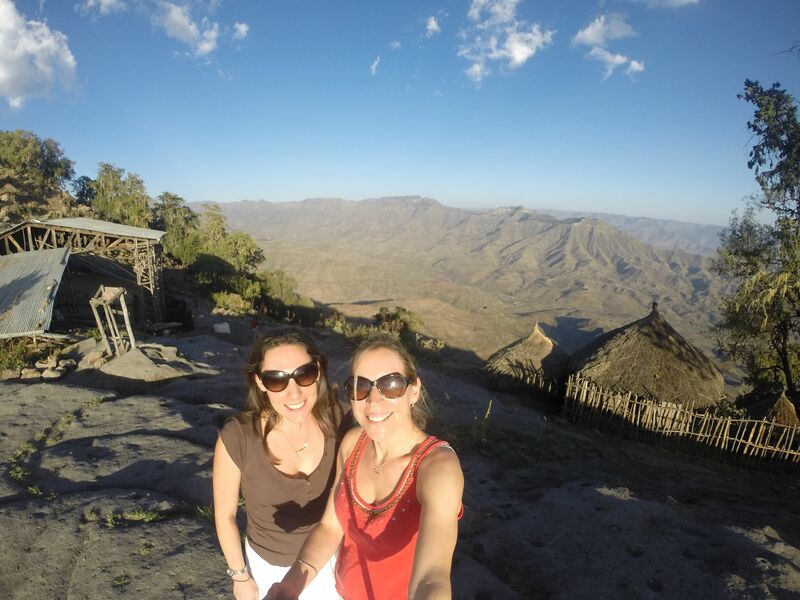 It is a stunning drive from the airport up to the town of Lalibela. The area is very arid & mountainous with round thatched huts dotted across the landscape. Fields near the river had been cultivated and it was fascinating to see the traditional oxen ploughing techniques which hadn’t changed for centuries. 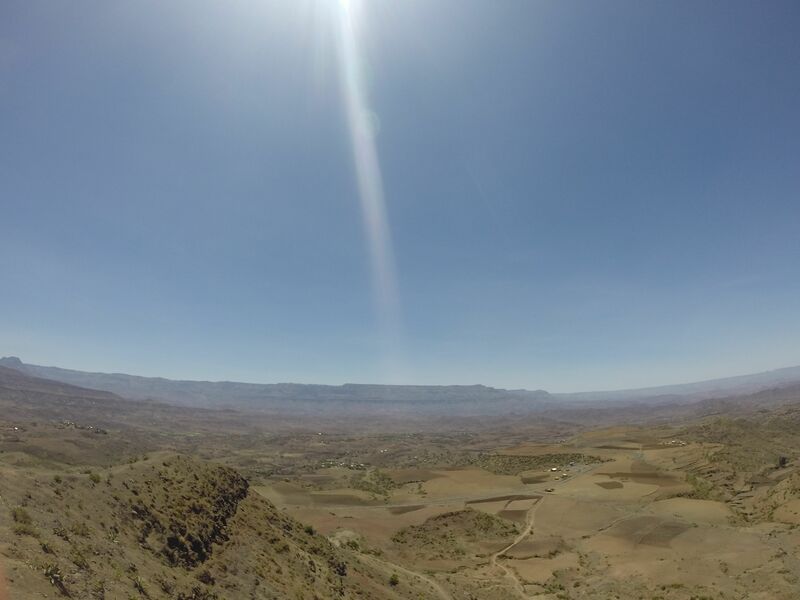 It was incredible how so many people can survive in such a dry, seemingly harsh environment and not hugely surprising when Dawit told us that this area was very badly affected by the droughts of 1984. We checked into Mountain View Lodge which has a cool angular design and stunning views from each of the relatively simple rooms. It is the best place to stay in Lalibela & the food is delicious. 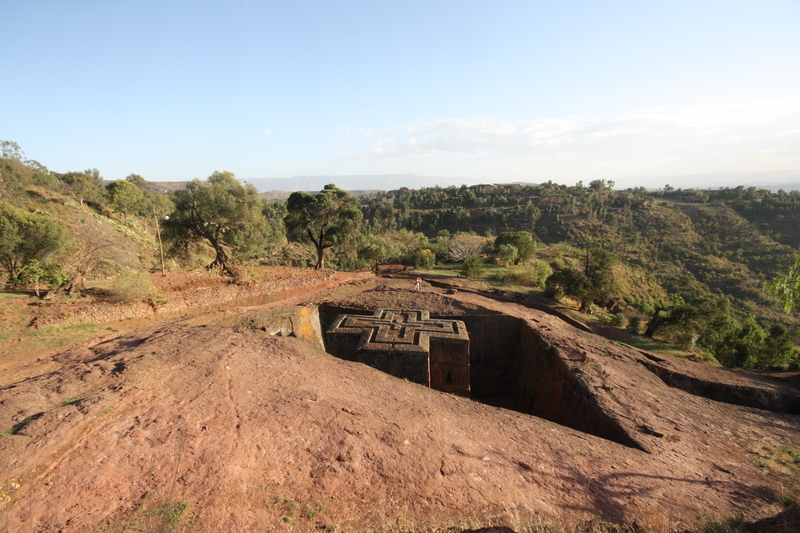 View of Lalibela from Mountain View Hotel. 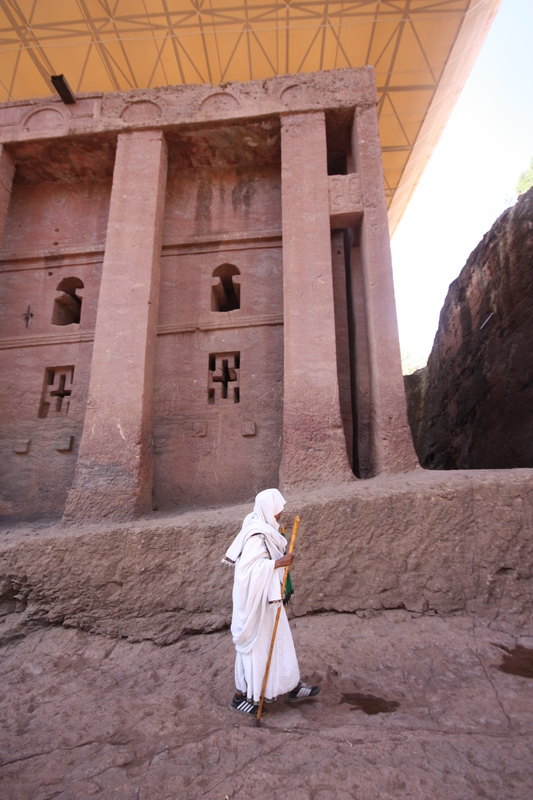 Lalibela is famous for its 12 rock churches which are divided into two groups in the centre of the town. The daily church service had just finished so it was quite a sight seeing everyone emerge from the churches all in their white finery. The gathering crowd waiting for GW Bush. We set about visiting the main group of churches first despite a slight distraction & delay caused by the fact that George W Bush & his entourage were about to turn up & we were desperate not to miss him! 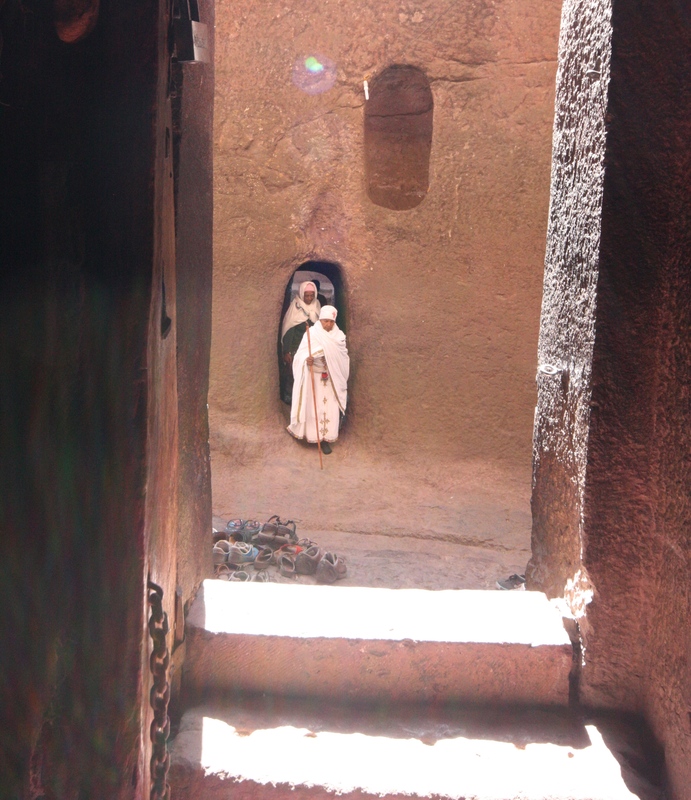 Our guide Dawit very sensibly said for us to see the churches first & then come back up & catch a glimpse of him…he was well experienced in knowing that ‘dignatories’ are never on time….which he wasn’t! The churches were incredible. 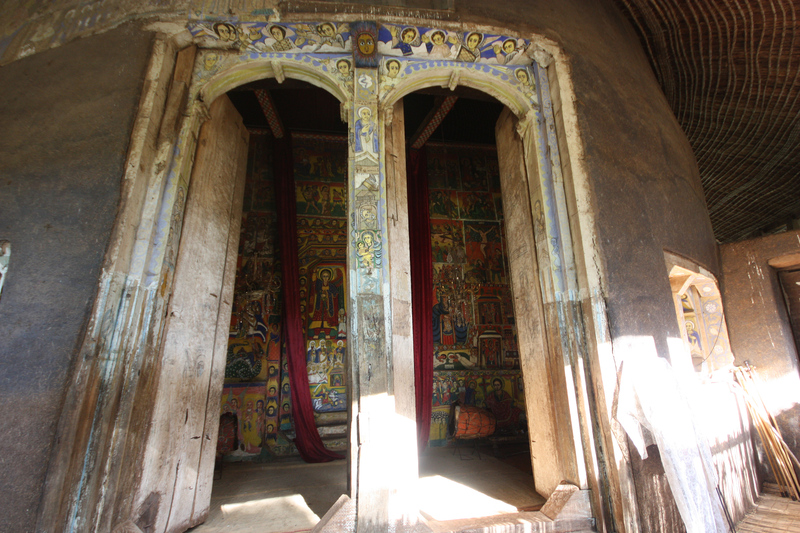 It took King Lalibela 25 years to create the 12 churches. Folklore says that they used to work on the churches during the day and at night angels flew down to help them and carry on their work. 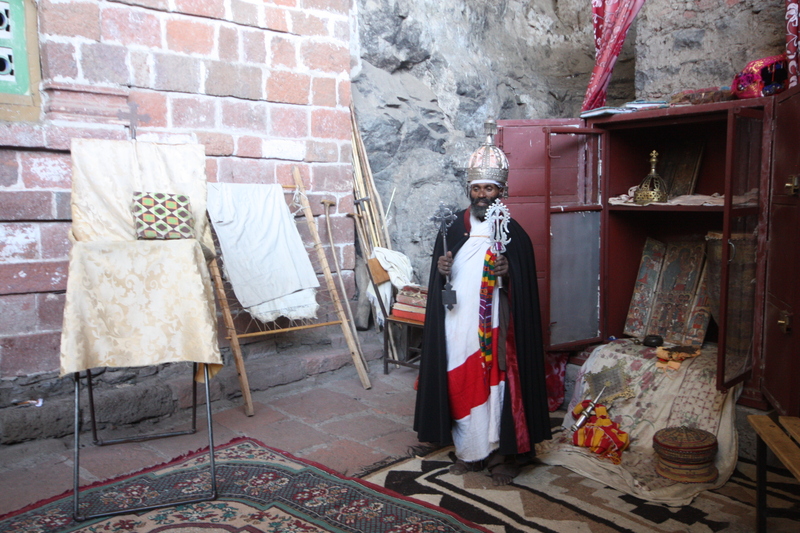 King Lalibela is said to have seen Jerusalem and then attempted to base Lalibela on a new Jerusalem concept in response to the capture of old Jerusalem by Muslims in 1187. As such, many features have Biblical names – even the town’s river is known as the River Jordan. 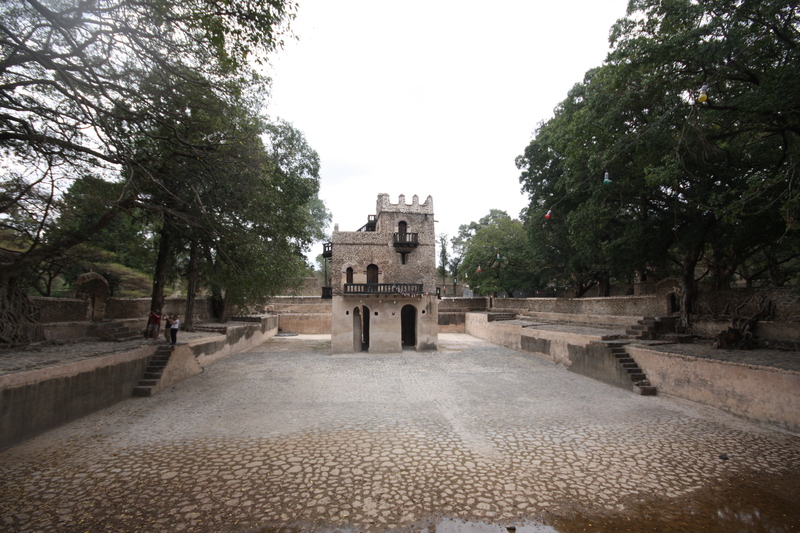 It remained the capital of Ethiopia from the late 12th century and into the 13th century. Each church is guarded by a priest. It is a photographer’s paradise with the combination of the photogenic priests, churches and light breaking through the tunnels and doors. The paps waiting for GW! A couple of times we had to dart back to the gathering (small!) crowd at the entrance like a group of crazed fans but George W was taking his time to turn up. Eventually we heard that he was at the church of St George (appropriately!) We weren’t allowed into the church until he had finished but a few tourists who had been in the church when he arrived had said how humble he was and how happy he was to be snapped. Ironically if we hadn’t kept on rushing back to the entrance to see him we would have been in the church when he turned up…..that would’ve made a pretty cool selfie! When his entourage eventually decided to leave, we had a brief snapshot of him before he was swept away to the waiting crowds. The church of St George was incredible. It was lovely that it wasn’t covered by a protective roof like the other ones so you could get a good look at it. The evening light made for some perfect photo opportunities. On our way back to the hotel, Dawit took us to an Ethiopian house to experience a traditional coffee ceremony and to also sample some local honey wine & Ethiopian vodka. The latter nearly blew my head off but the honey wine was delicious! 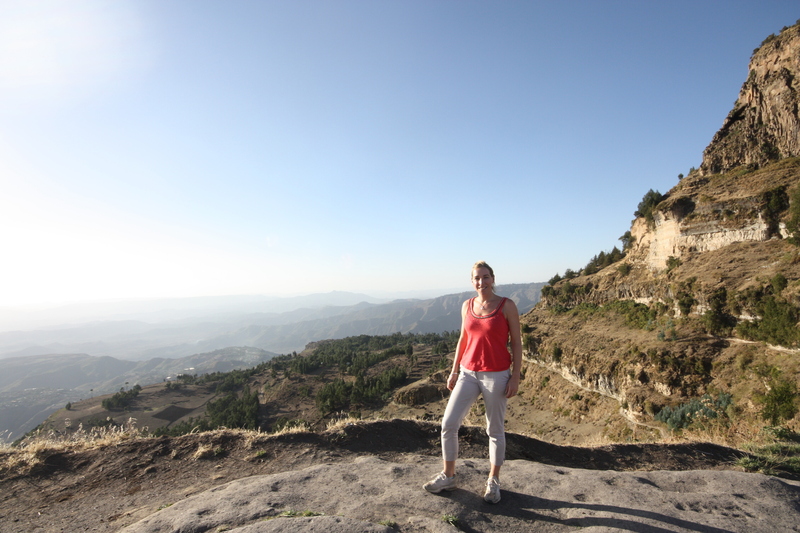 The morning view from my balcony was so stunning that I decided to make the most it by doing some stretches and yoga (I’m supposed to be in training for a triathlon…..even being in the running heart of Ethiopia didn’t inspire me to get my trainers on however!). 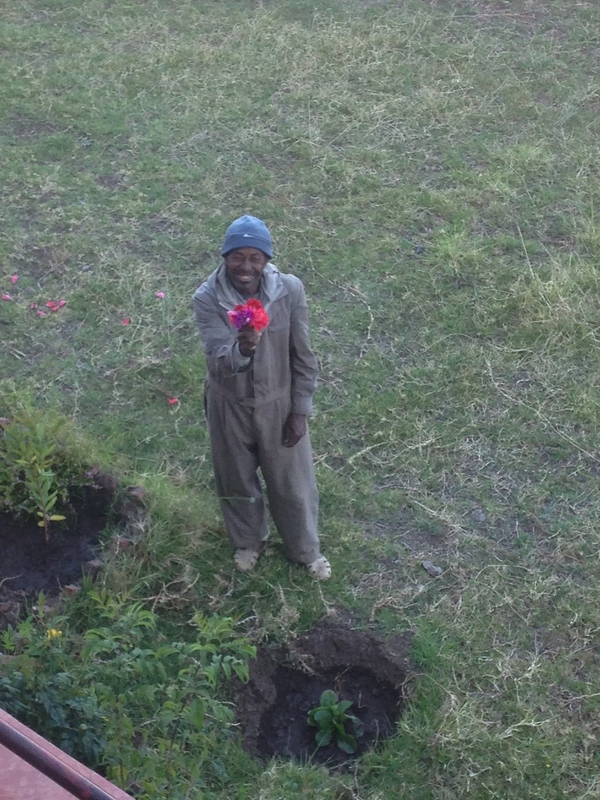 I soon realised that I was being watched and found myself re-enacting the Romeo & Juliet scene with the hotel gardener who had picked a bunch of flowers for me! Needless to say my training session was cut short! 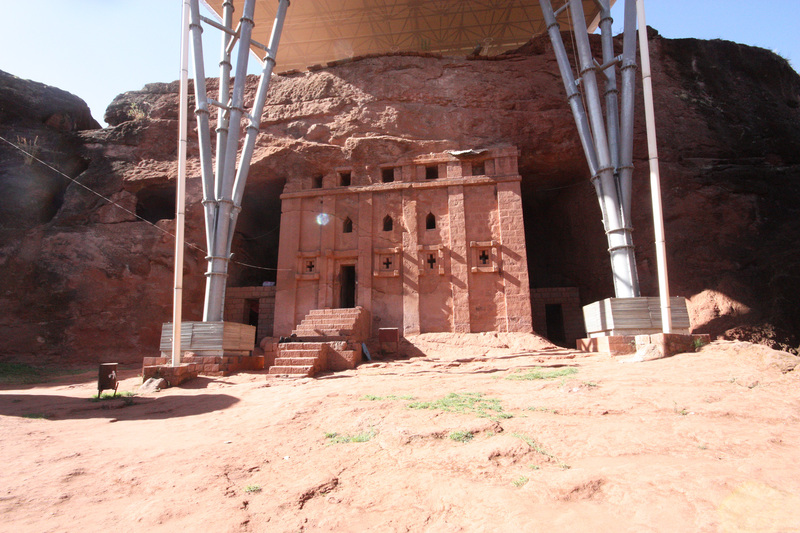 An outlying cave church of Nakuteleb near Lalibela is a relatively simple church built around a shallow cave in which several holy pools are fed by natural springs. It has many treasures and again we had a couple of very obliging priests happy to model for us. 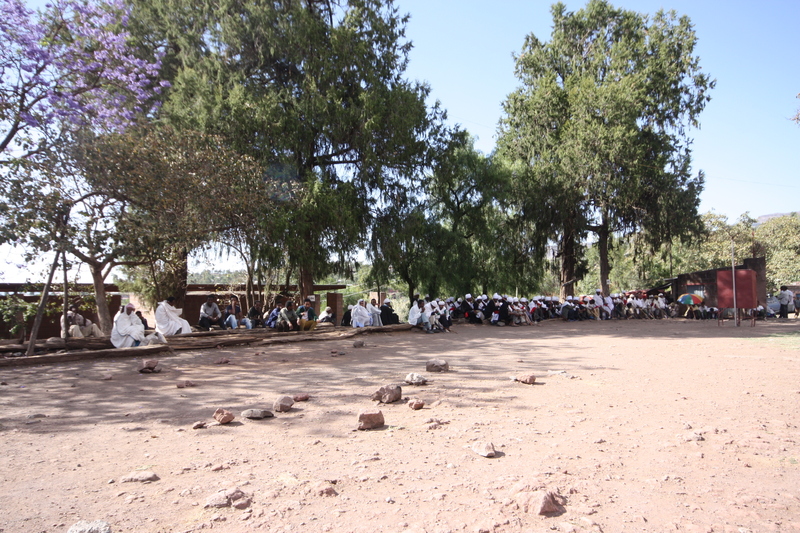 On our way back to Lalibela we popped in to visit a local primary school. We had brought some pens to give to the head master and he proudly showed us around (you get hounded by kids everywhere asking for pens but its much better to give them to a school to distribute than hand them out to kids begging). I think the children were as fascinated to see us as we were to see them.They gave us a gorgeous song before we proudly sang ‘Head, shoulders, knees and toes’ and ‘if you’re happy and you know it’. We were all very impressed with the school which seemed to have some really good faciliities. 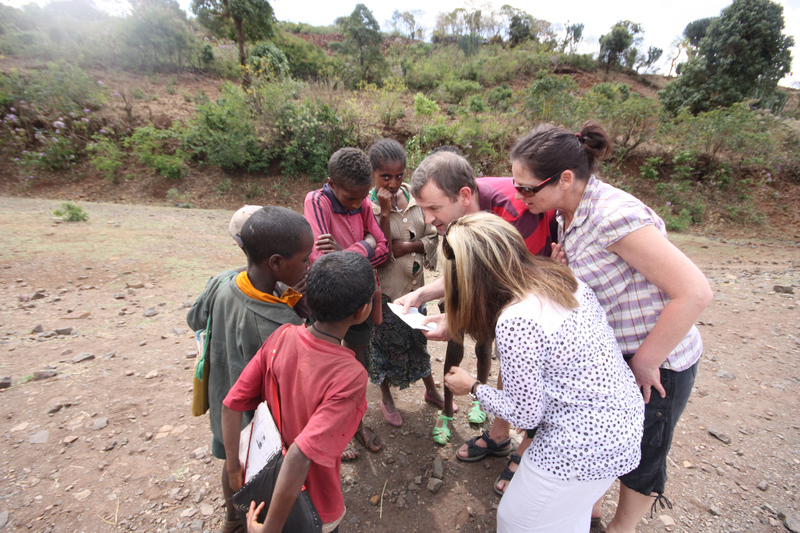 Ethiopia has many success stories not least its education policy. 15 years ago less than 50% of the Ethiopian kids went to school whereas now over 90% do.One thing which really struck all of us who had traveled around Africa extensively was how clean and tidy Ethiopia seemed to be with none of the usual plastic bags dotted around the place like in other African countries.After another delicious lunch of Ethiopian buffet at the Mountain View Hotel, we were energised enough to tackle the second group of churches. 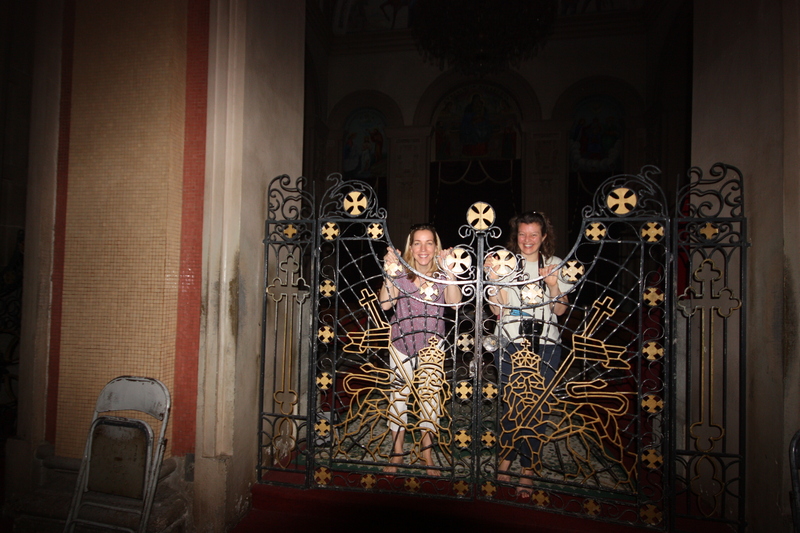 These churches were more challenging to access with the group climbing through holes in the walls and tunnels. 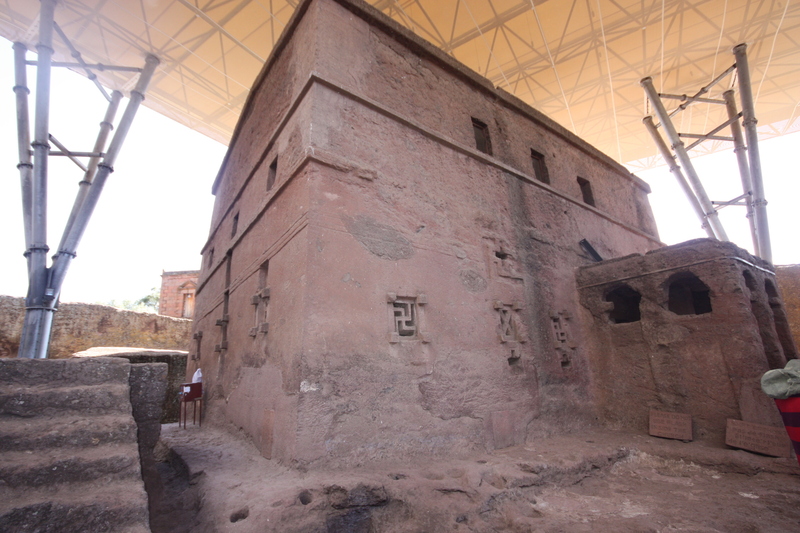 My favourite was House of Emmanuel which was designed by Lalibela’s wife and is considered to be the most challenging architecturally as it is freestanding but still attached at the roof. 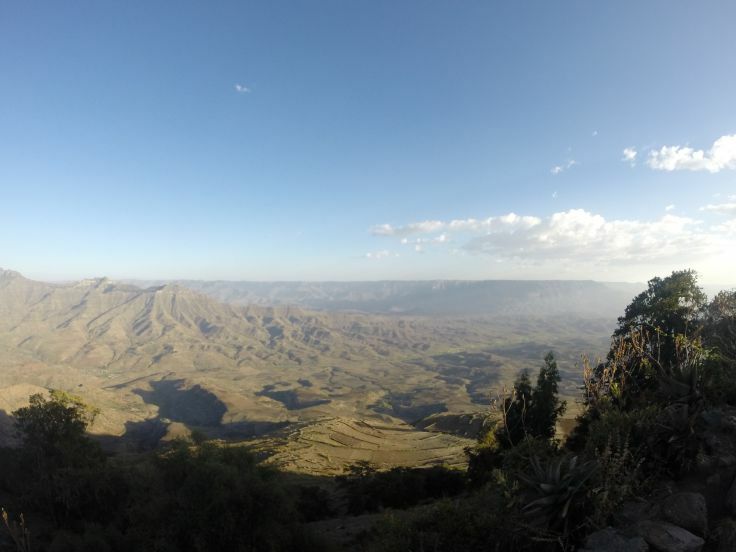 Our 30 minute drive up to the Asheton Maryam Monastery took us up some incredibly stunning scenery and we climbed to an altitude of almost 4000m. 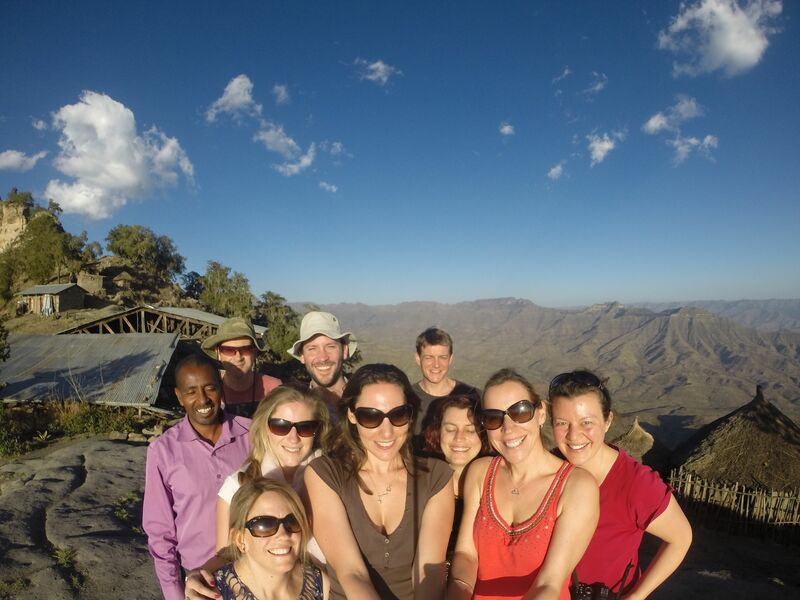 The 20 minute walk up to the monastery gave us the opportunity for some great photo ops including some Gopro group selfies! 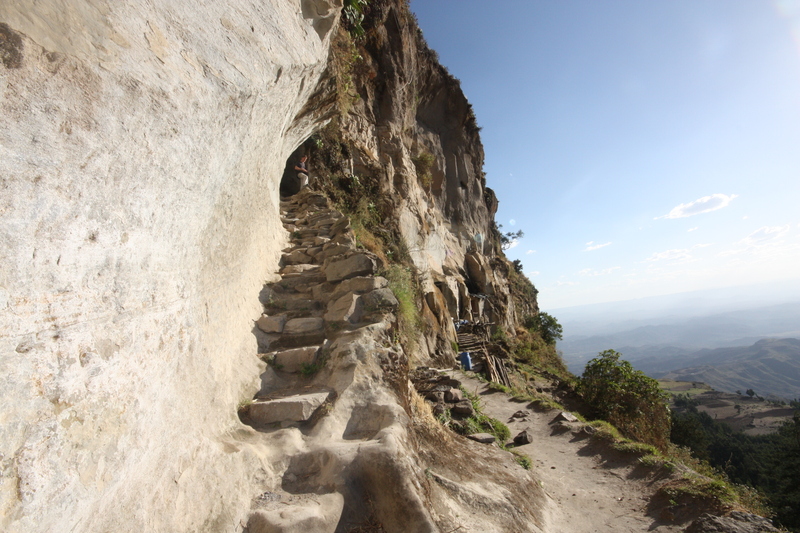 Today was spent travelling from Lalibela to Bale Mountains. 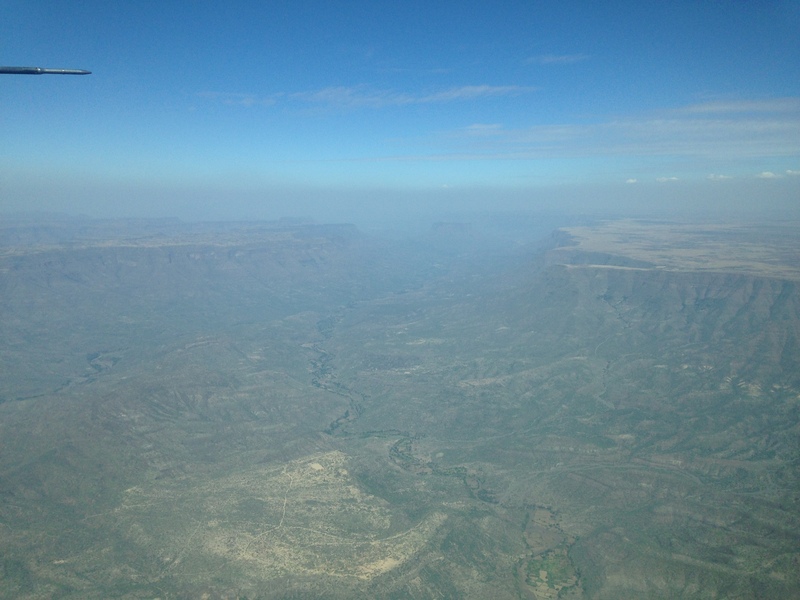 The plane trip from Lalibela to Addis took 1.5 hours as we went via Gondar. 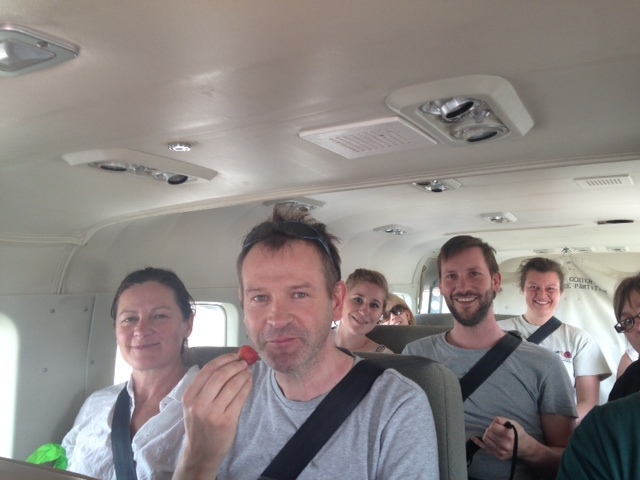 Everyone was excited to board the private charter for the one hour plane trip down to Robe. 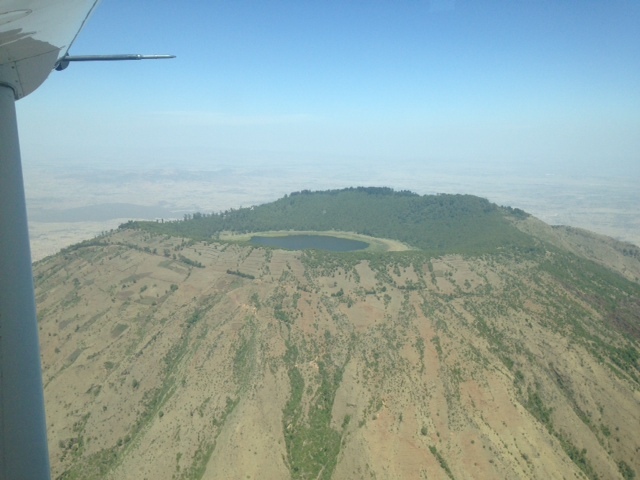 The flight was stunning flying over the Rift Valley…..
We also flew over a volcano with a monastery on the top. We were met at Goba airstrip by Guy Levene, owner of Bale Mountain Lodge and 3 other four wheel drive vehicles from Kibran Tours. 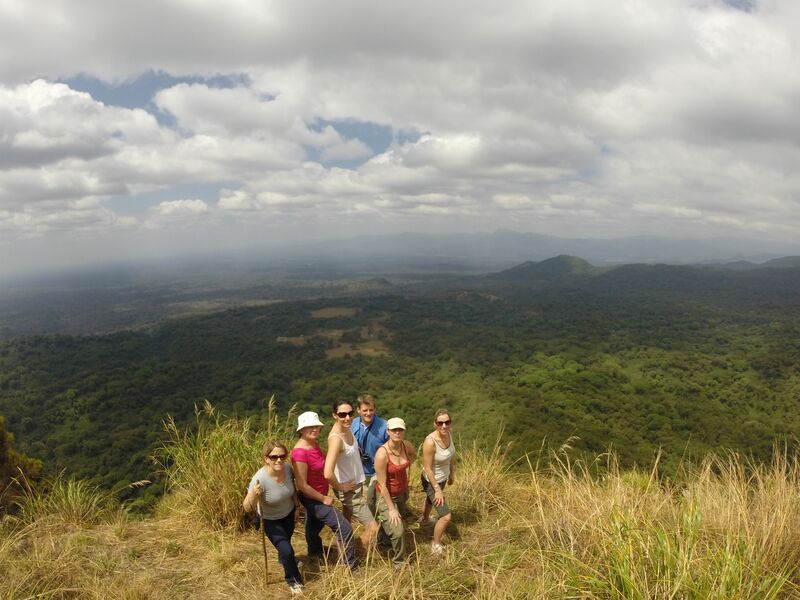 We set off on the 2 hour transfer to the lodge and the change in the landscape as we climbed up onto the plateau was incredible. It was such a different, barren but hauntingly beautiful landscape. 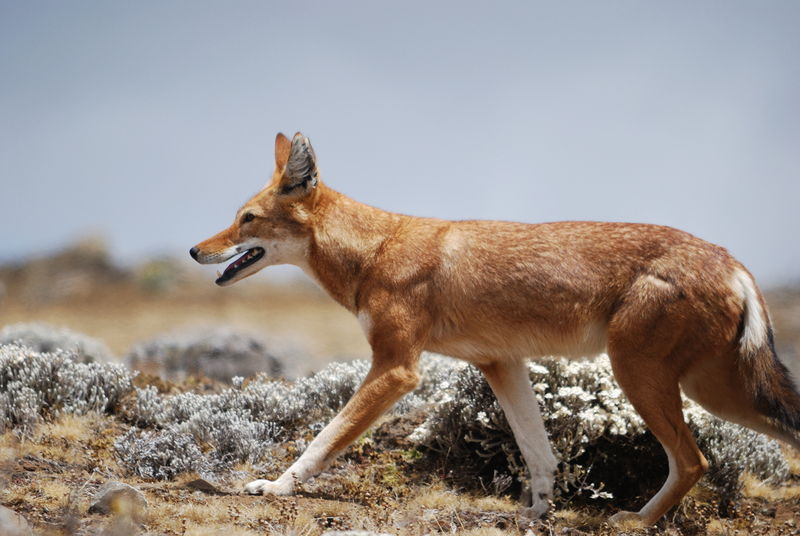 The Sanetti plateau is the largest expanse of Afro alpine habitat in the world and is the best place to see the world’s rarest canid – the Ethiopian wolf. There are around 450 wolves left and 60 % of them are found in the Bale Mountains. 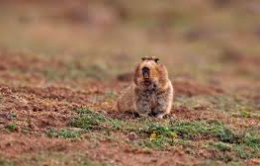 They are relatively easy to spot as the landscape is so clear and they tend to be out hunting in the mornings and evenings. Guy crosses the plateau at least twice a week and said he will see the wolves on 85% of his journeys. 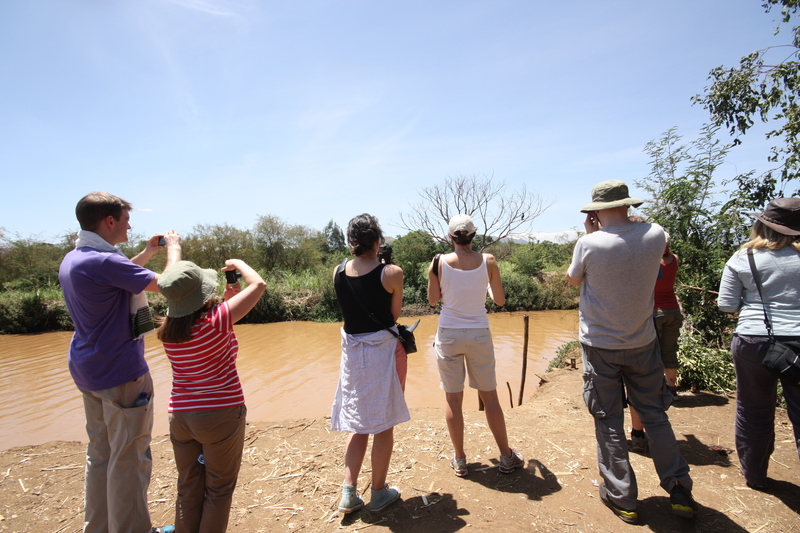 The transfer is a fascinating game drive and as we were lucky enough to have Guy driving us, he brought everything to life pointing out endemic birds & mammals such as a the Rougets Rail and Giant Mole Rat (the Ethiopian Wolf’s favourite dish!). Guy stopped on top of the plateau to brief the team that we were entering the Ethiopian Wolf territory and to keep our eyes peeled. Within 5 minutes of setting off two of the groups spotted a female lying close to the road. A further 10 km on and we were lucky enough to see a wolf hunting for his dinner. It was fascinating to see them pat the ground trying to encourage the rodents out of the ground ready to be caught. 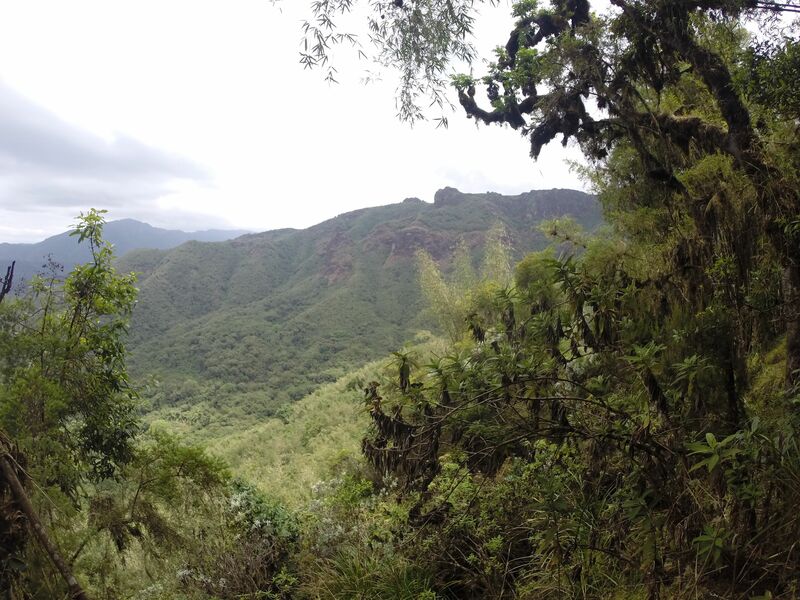 It took us about 45 minutes to cross the plateau before we started dropping down into the Harenna Forest, the second largest forest in Ethiopia covering 4000km2. 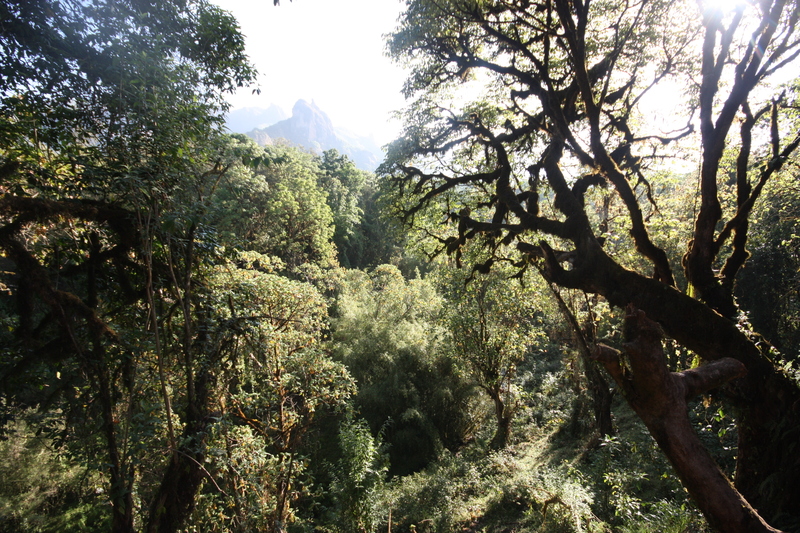 Ethiopia is one of the top 25 bio-diversity rich countries in the world and the Bale Mountains have one of the highest incidences of animal endemism of any terrestrial habitat on earth: the park itself holds 26% of Ethiopia’s endemic species. 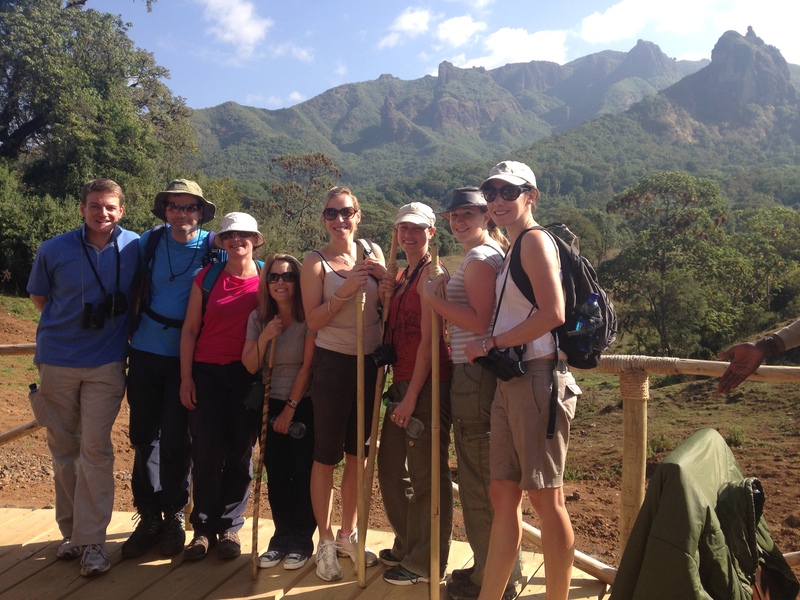 The Bale Mountains is also listed as one of the top 4 birding spots in Africa with over 300 species being found in the area. We arrived at the lodge just as the sun was going down and it was so nice to eventually get to experience it first hand having been working with Guy & Yvonne for 18 months in the lead up to the opening. Yvonne was there to greet us with drinks & delicious nibbles and each of the wood burners were lit making our rooms lovely & cosy. Just what was needed after a long journey! The lodge looked amazing & they had done a great job of combining traditional design with contemporary style. We all had a quick shower and change and reconvened around the fire pit for more drinks & nibbles. Dinner was a delicious meal of Tilapia, sauteed potatoes & cauliflower cheese followed by caramelized bananas & tropical sorbet. The food was far better than anything else we’d eaten and whilst it had been lovely to experience the traditional Ethiopian food, it was nice to have some western dishes! 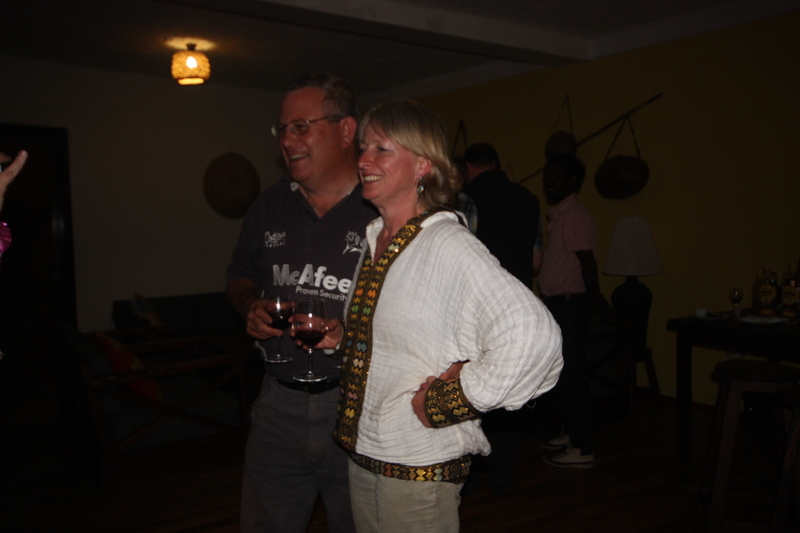 Guy & Yvonne had invited Eric , the Manager of the Ethiopian Wolf project who gripped us all with updates on his work. The biggest threat to the Ethiopian wolf is rabies that they can catch from domestic dogs so a big focus for Eric was on a vaccination programme for the dogs.We all fell into bed exhausted after our days travelling but keen to make the most of our next only full day at Bale Mountain Lodge. With only one day at BML, we wanted to make the most of our time so we split into groups with the keen birders going off with the naturalist James and the rest of us attempting to summit Mt Gushuralle, the volcanic plug in front of the lodge (seen on the right of the picture below). 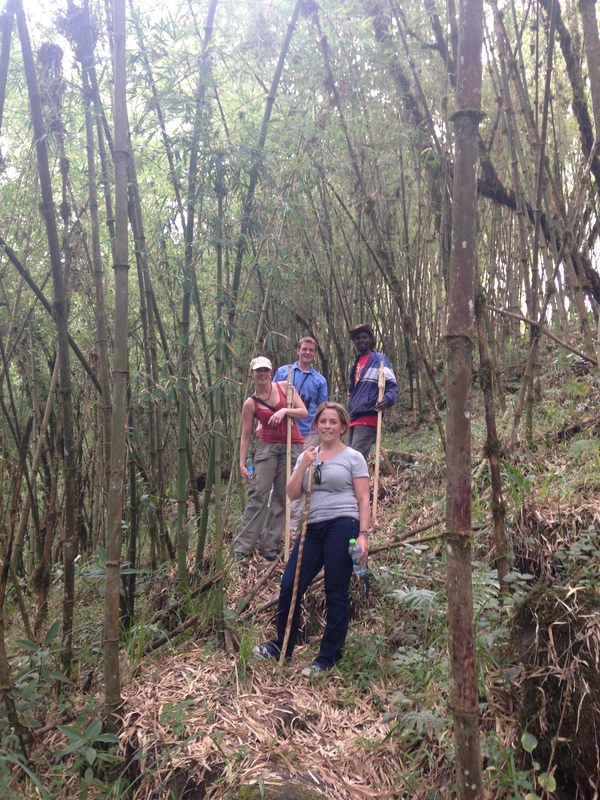 The walk took us through the Harenna Forest and up through the bamboo forest which provides the very important habitat for the Bale Monkey. 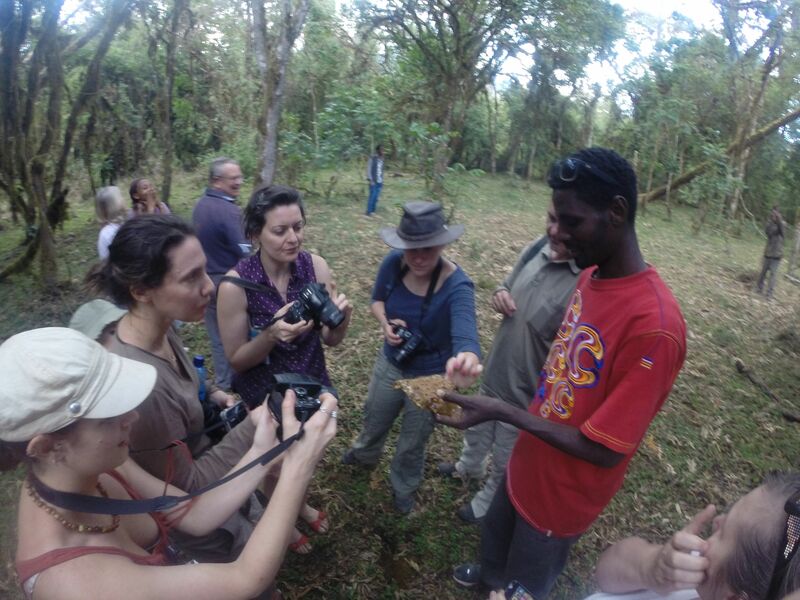 Unfortunately the Bale Monkeys were shy that day but we did see plenty of Colobus monkeys and birds. Ibrahim our guide was excellent at telling us about the birds & plants that we were walking past and the view from the top was well worth the 2 hour climb. Ibrahim is passionate about the mountains and has been so motivated by the work that Guy & Yvonne are trying to do that he has set up an environmental club to educate the local population about over grazing etc. 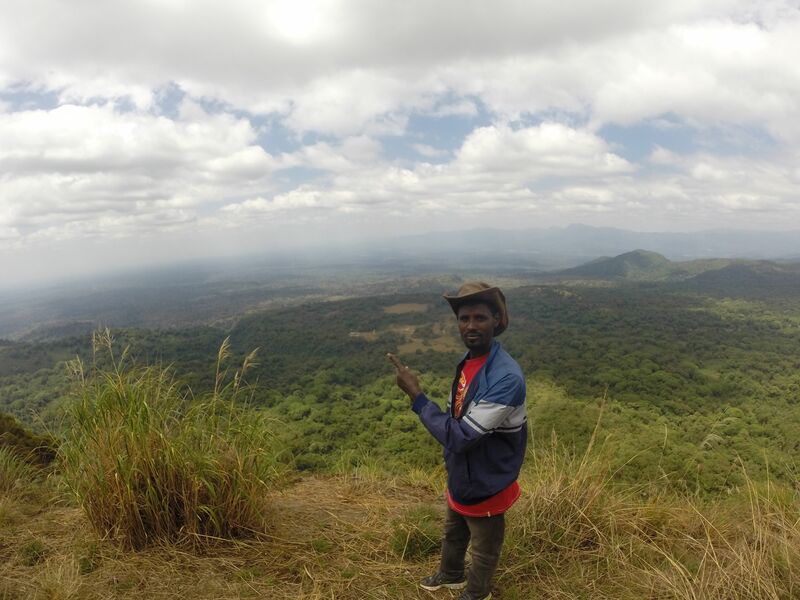 It was great to see how the impact of BML being built has motivated local young people like him to help preserve the forest and their surroundings. 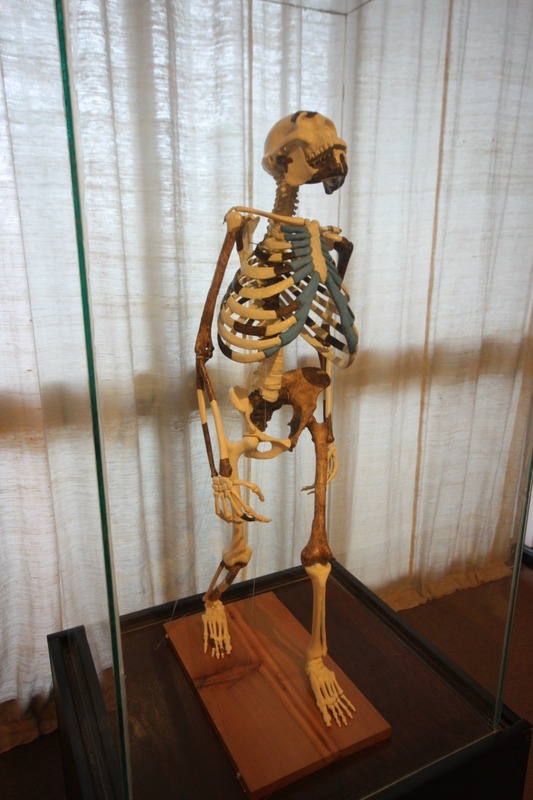 The forest is home to the Bale monkey, a vervet type monkey wtih a little white beard. It is also home to many bird species including the Abyssinian catbird, yellow-fronted parrot. Menelick’s bushbuck & giant forest hog are easily seen with more rare visitors being African wild dog and black maned lions. We saw a number of droppings from leopards, lions, honey badgers and hyenas but unfortunately none of them were brave enough to show their faces! After a delicious lunch of pumpkin soup, pasta salad and fritata, a group of us went on a short horse ride. In this area of Ethiopia there are horsemen with horses everywhere. The horses look well looked after and the saddles & bridles were very comfortable. Unfortunately we only had time for a 45 minute short hack but it would be lovely to spend half a day exploring the forest by horseback. Next up was a site inspection of the rooms. So far 7 of the intended 12 rooms of phase one have been completed. 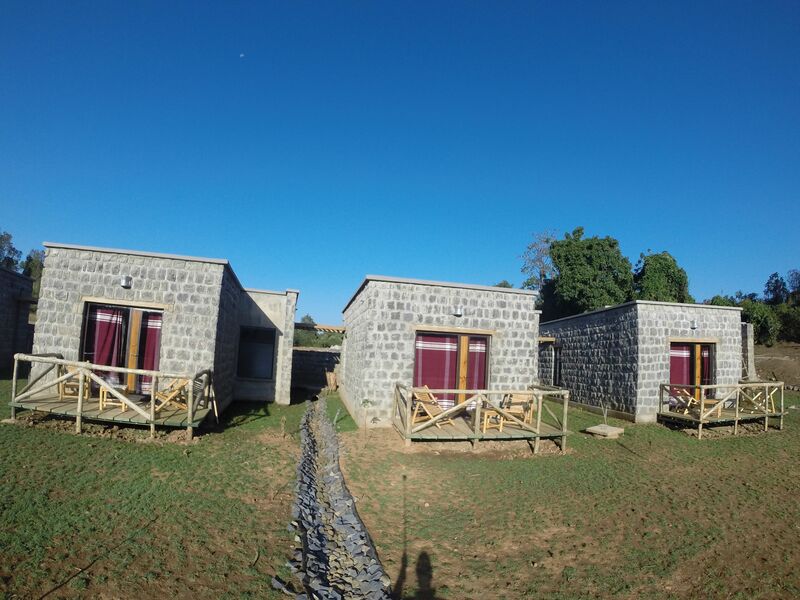 The remaining rooms will be completed over the rainy season and will come online in September. The final 3 rooms will be completed in phase two which will finish by the end of 2015. 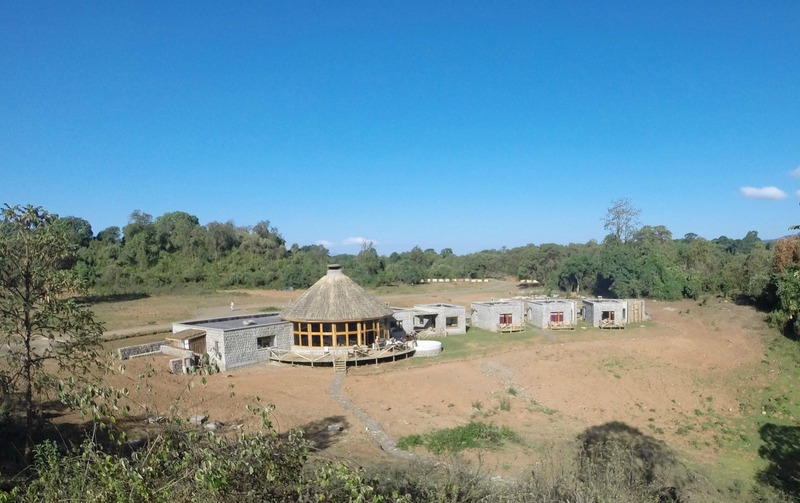 There are 3 rooms attached to the main lodge which are wheelchair friendly and 5 rooms dotted on the hill side in front of the main area with amazing views of the mountains and overlooking the stream that runs through the plot. The stream has two waterfalls just in front of the rooms and Guy & Yvonne are planning to create a decked area around these stunning natural swimming pools. This will be a lovely area to be able to chill out at. ‍As it can get cold in the evenings at BML due to the altitude, all of the rooms have wood burning stoves & hot water bottles which make them very cosy! All the rooms have been built using traditional materials, in order to blend in with the forest and to be as ‘low impact’ as possible. Before any construction began a thorough environmental impact assessment was made, and technologies put in place to help make the Lodge carbon neutral. No trees have been felled in the construction of the Lodge, as the rooms have been built around the trees that were here, inside a natural clearing. View from Room 5 – this is room which is furthest away from the mess area therefore perfect for those who want to be completely immersed into the forest. We finished off our jam-packed day by witnessing some traditional honeyharvesting. It was fascinating to the see the honey farmer shimmying up the tree with such ease and also terrifying to see how high he had to go! Once he is safely settled up at the top of the tree, his partner on the ground sends up the Spanish moss bundle which he lights and puts into the hive. This sends the bees out of the hive & makes them sleepy which makes it safe for him to put his hand in and collect the honey. The honey was absolutely delicious and one of the projects Guy & Yvonne are helping the local community with is to help start selling it to tourists & to other parts of Ethiopia.The delicious lamb stew and amazing sticky toffee pudding was the perfect way to round up the day. We were also lucky enough to be treated to a traditional coffee ceremony as a farewell…..I’ll certainly miss the delicious Ethiopian coffee! 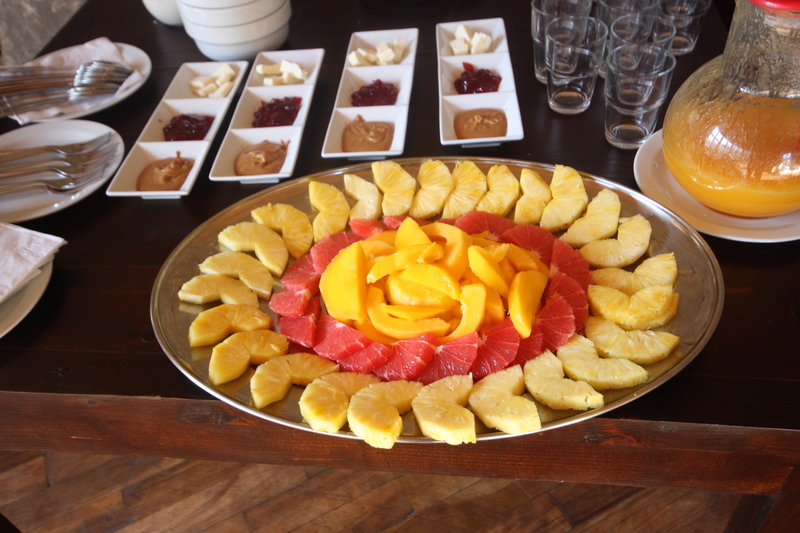 A delicious breakfast was the perfect start to the day to set us on our way for our long journey to Addis. Our speedy transfer over the plateau didn’t allow us the chance to see a wolf but we did see some wart hogs, Mountain Nyala and Bush buck. 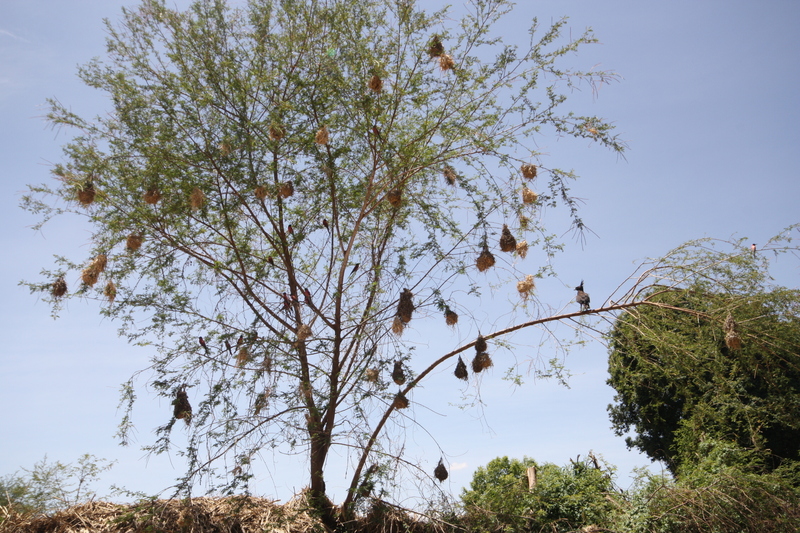 The drive to Addis takes about 7-8 hours but we advise most people to stop on the way down at the Rift Valley lakes and stay a night at one of the lodges on Lake Langano (we normally recommend Bishangari). This is a stunning area and a lovely way to break up the journey. The roads are very good so you can do the journey in one go but it is quite a long day’s drive. 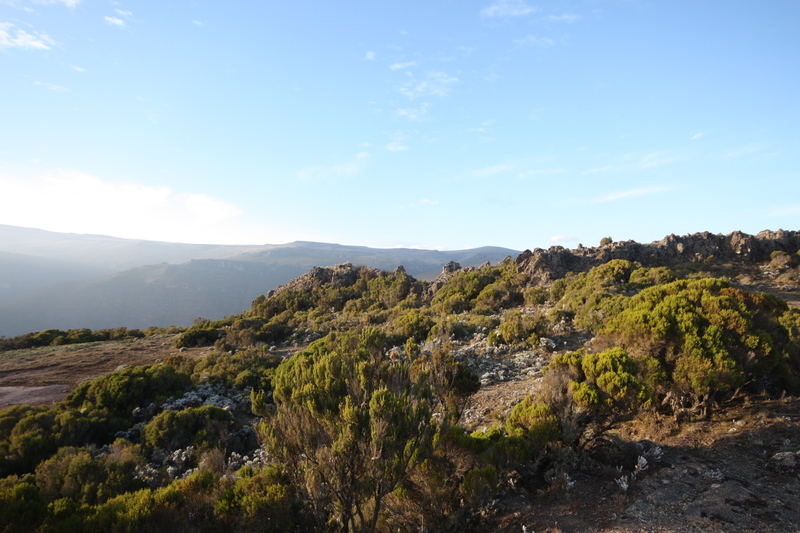 Up until the end of 2012, Bale Mountain National Park was really off the beaten track as the road from the Rift Valley road to the park was a dirt road so took up 10 hours to cross. 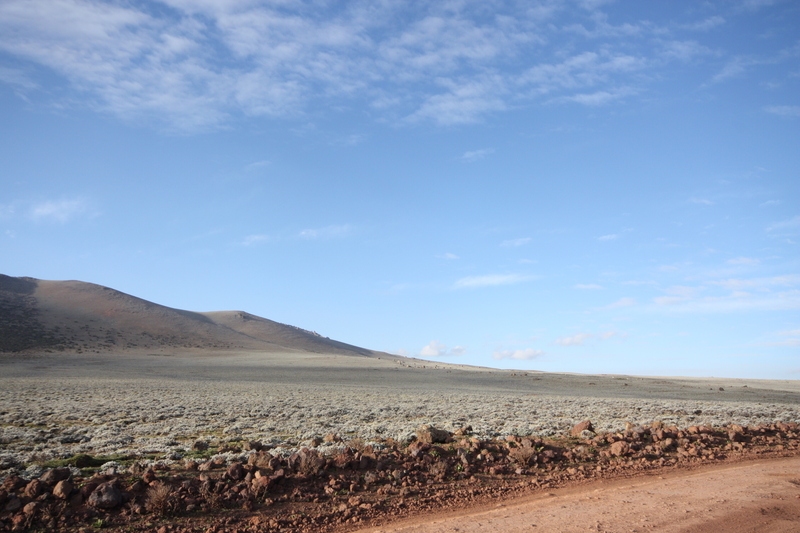 18 months ago they completed a brand new road which now makes this transfer only one hour long and has made the Bale Mountains far more accessible for tourists. The drive is fascinating passing through some stunning landscapes and villages. Its worth pointing out to your guests that Ethiopia does not have many ‘rest’ places so often you have to make do with a bush on a long drive! 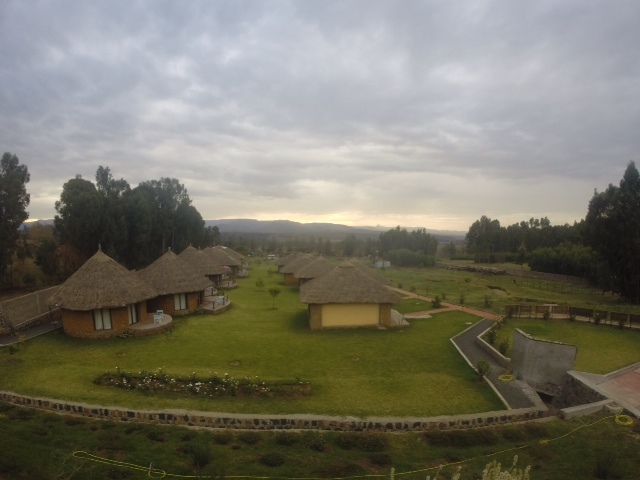 We stopped off for lunch at the Kureftu Lodge at Debre Zeit which is a lovely spot overlooking a lake. The last remaining hour to Addis was quite painful with lots of overtaking. However a new motorway is due to open in two months time connecting Addis and Nazret which will reduce the journey down by one hour & avoid the need to do some heart stopping overtaking. Kibran Tours thoroughly spoiled us for our last night in Addis with a cocktail party for the group with local dignitaries including Soloman Tadesse who has recently been appointed to head up the new Ethiopian Tourism Authority which is a combination of public and private sector partners whose remit is to develop tourism in Ethiopia. It was fascinating chatting to him and his team about his plans to develop tourism in a country where it is really in its infancy but with so much potential. Assefa from Kibran Tours was keen for us to experience some of Ethiopia’s famous music scene and took us out to an Ethiopian Jazz evening. It is said that the driving force behind Etho-Jazz is Mulatu Astatke who first created it 42 years ago while studying music in the United States. It was mindblowing enjoying the most incredible jazz in a very unassuming cafe in the middle of a shopping centre in Addis! 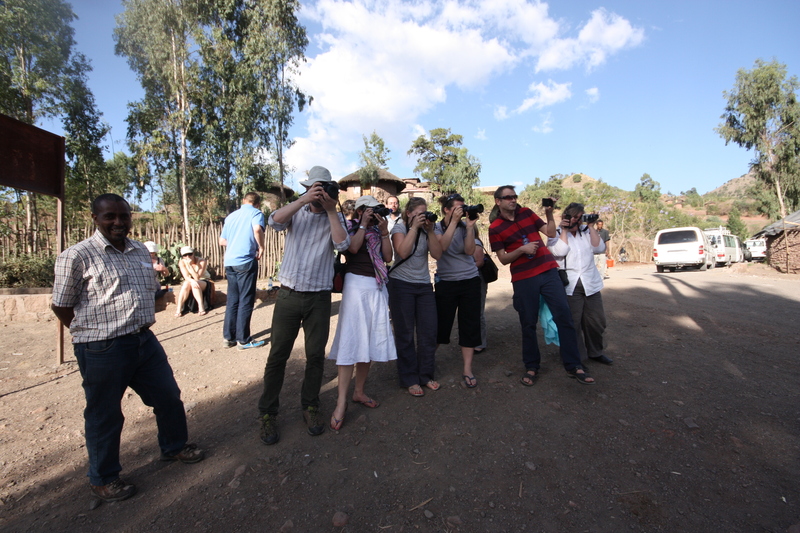 For me that evening summarised our entire trip to Ethiopia…..totally unexpected, unanticipated, and fascinating with unbelievable potential.